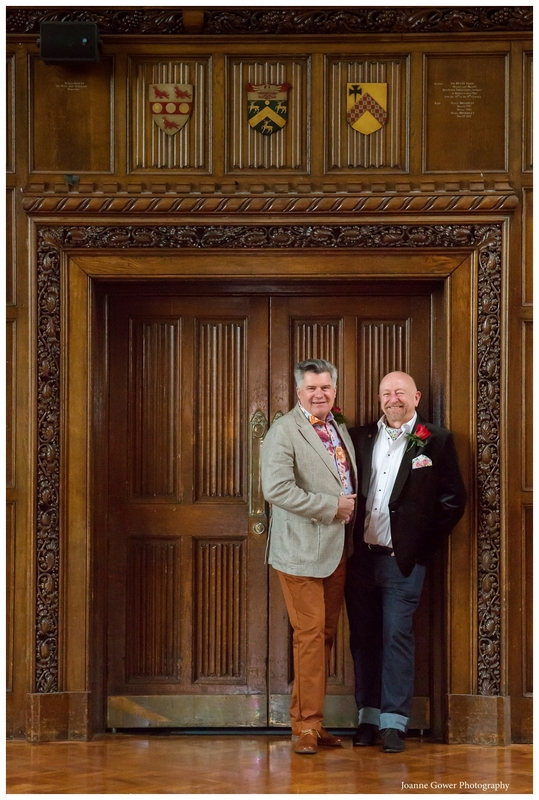 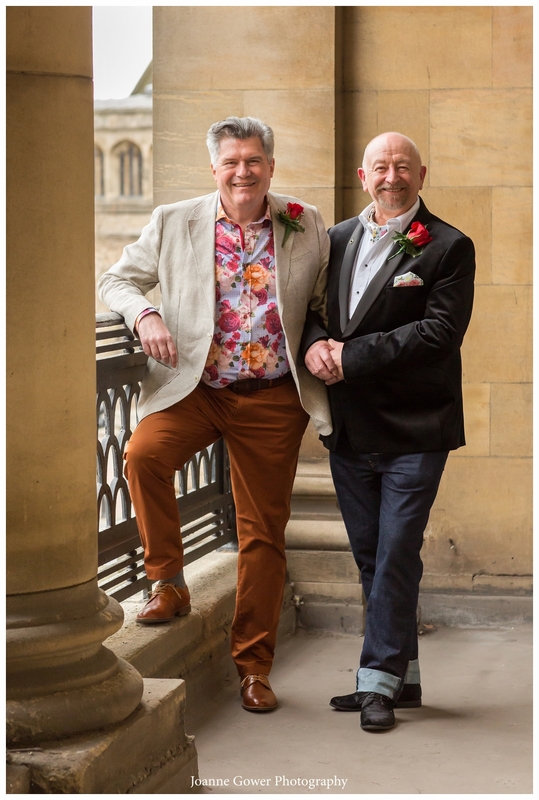 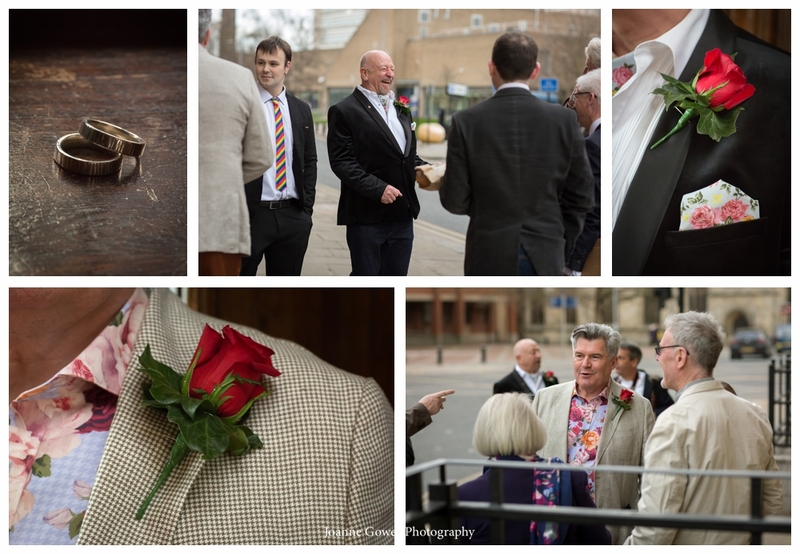 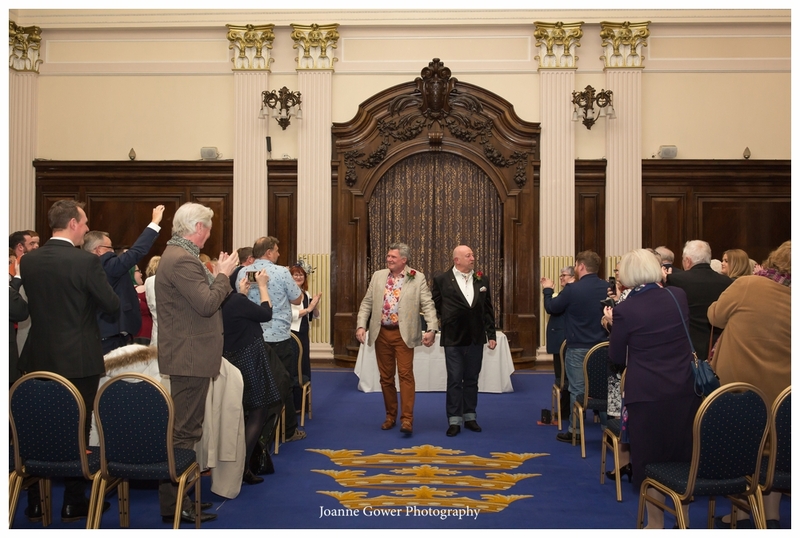 Yesterday I had the honour of documenting the wedding of Colin and Graham. 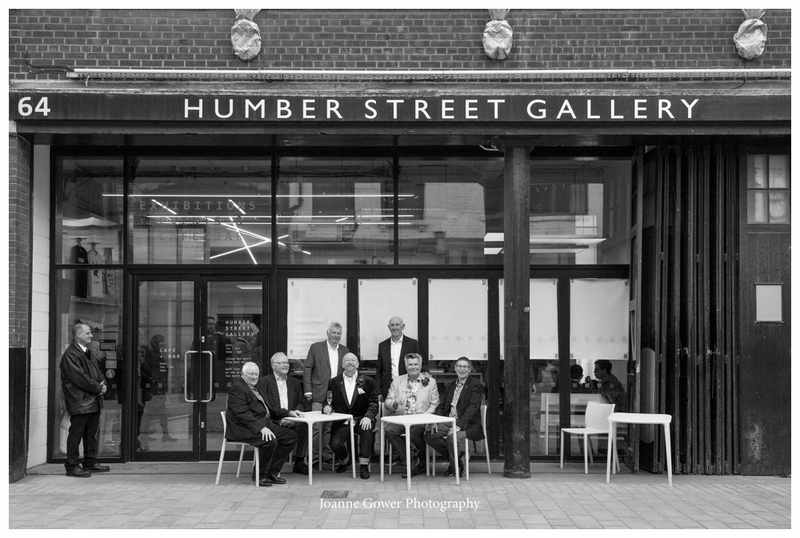 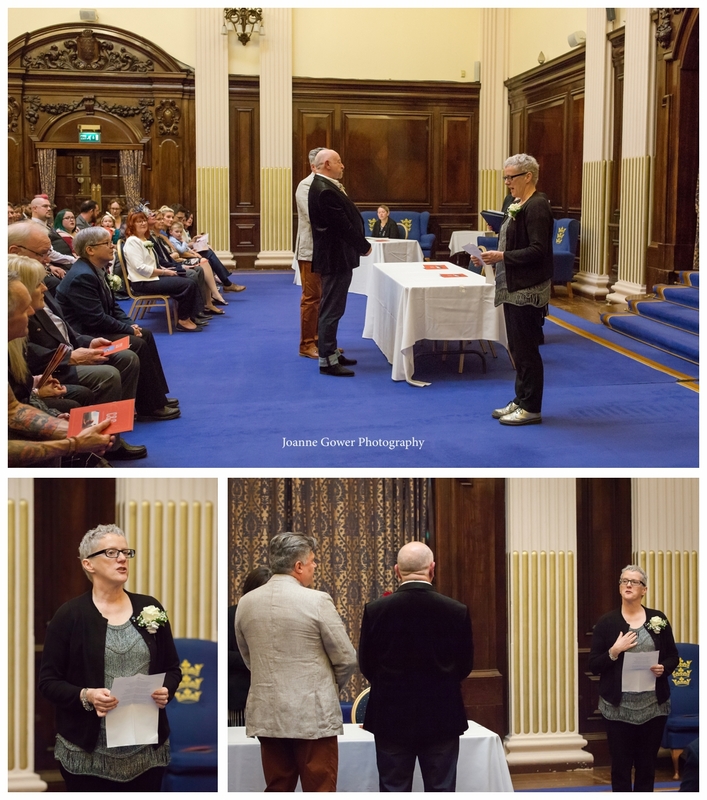 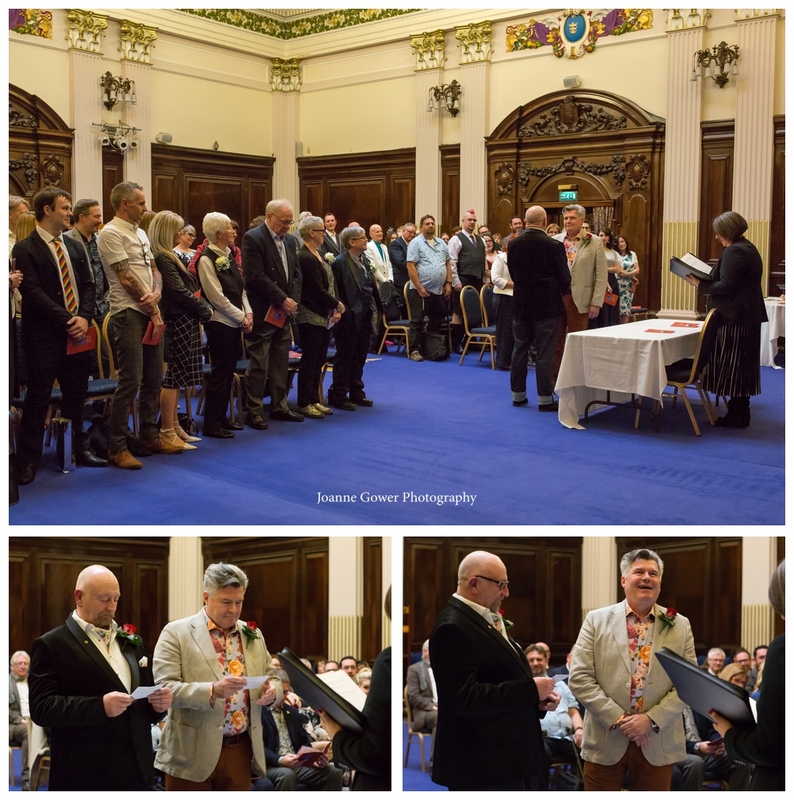 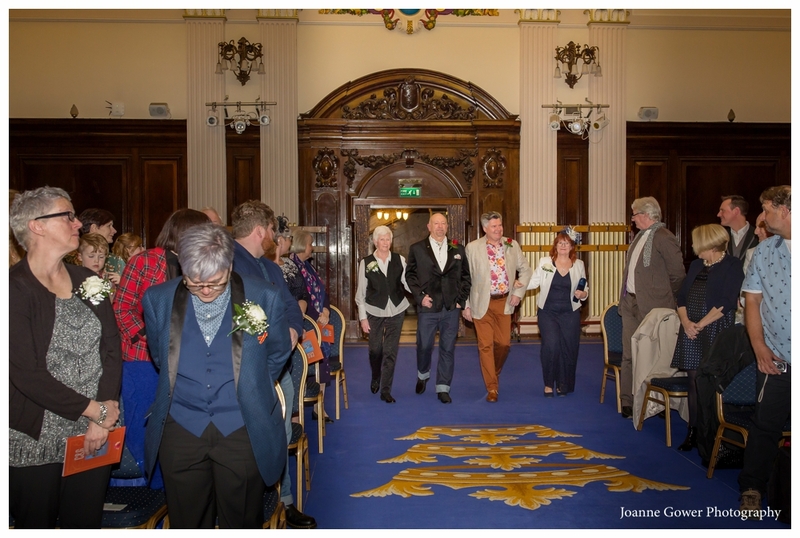 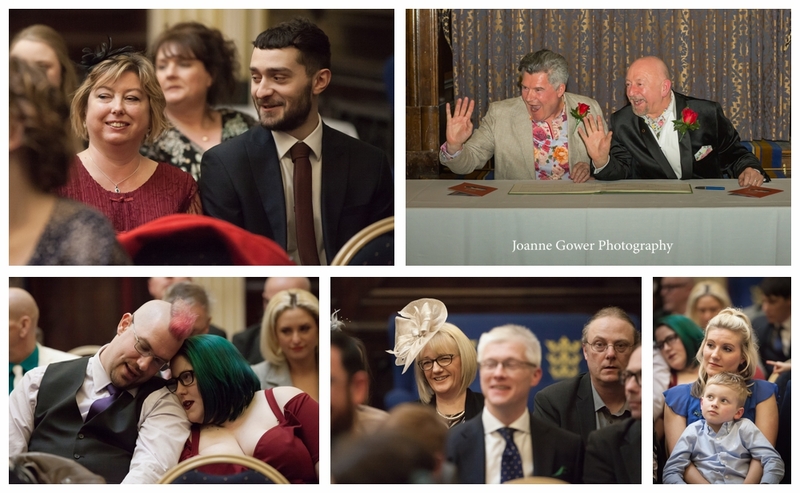 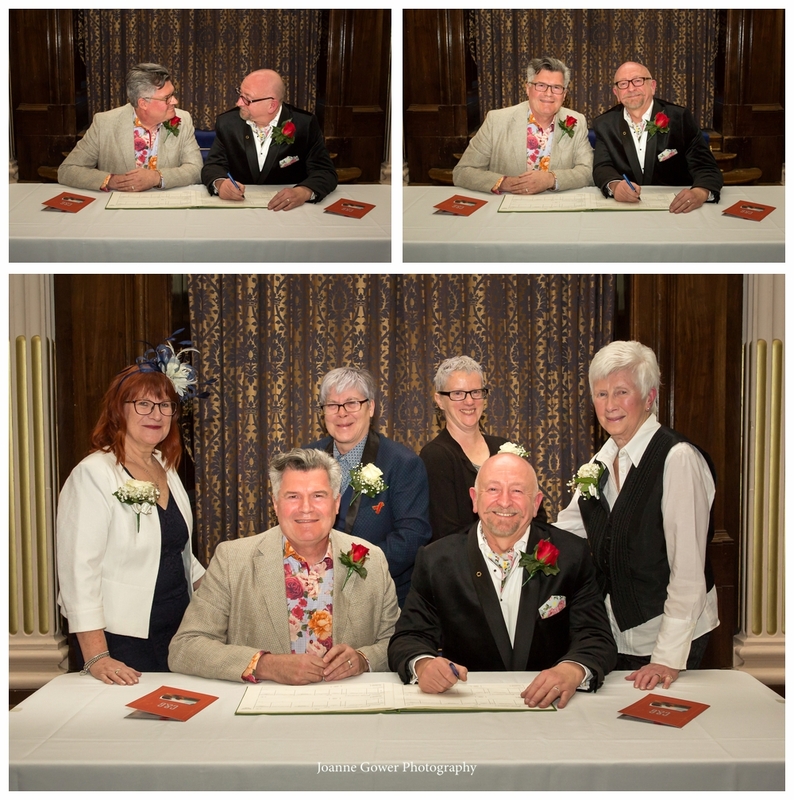 They have been together for 39 years and finally tied the knot at the Guildhall in Hull. 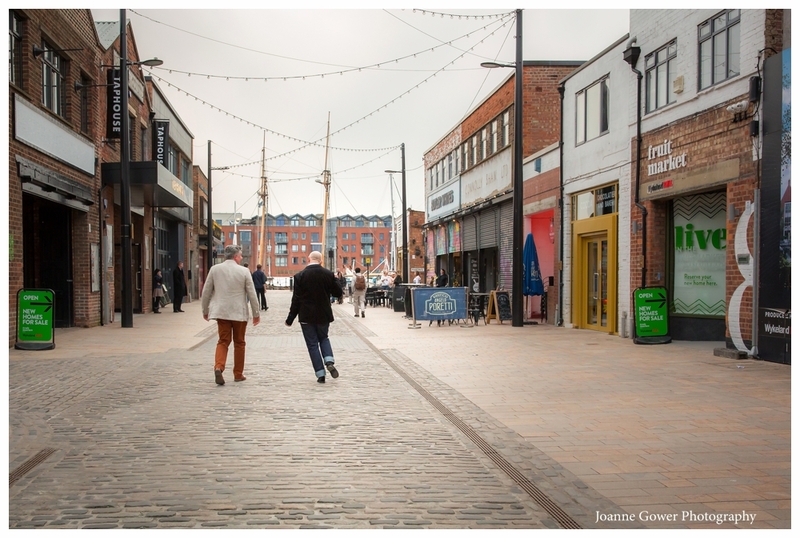 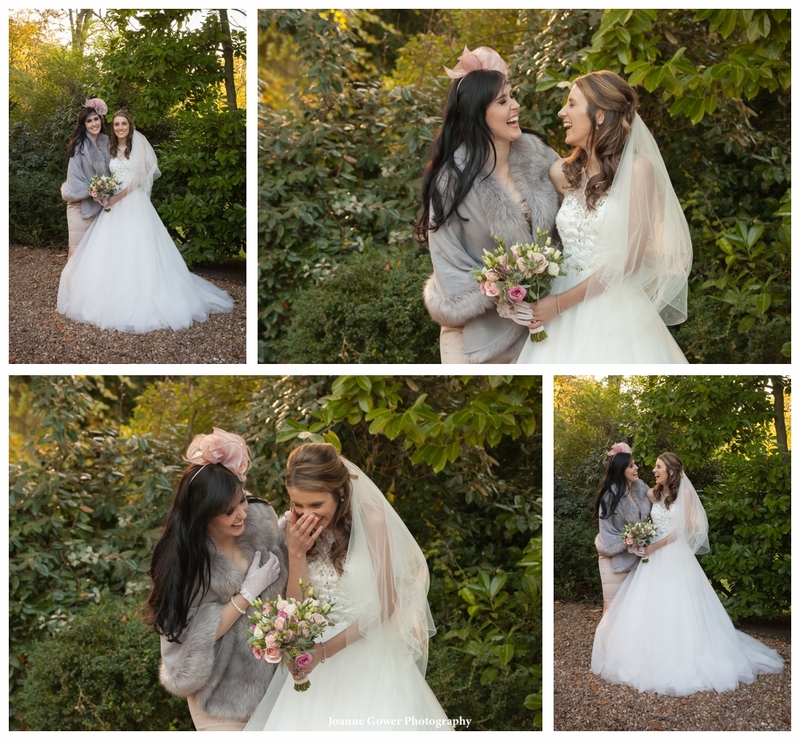 They wanted a relaxed and informal day and our photography brief was to capture the day as naturally as possible. 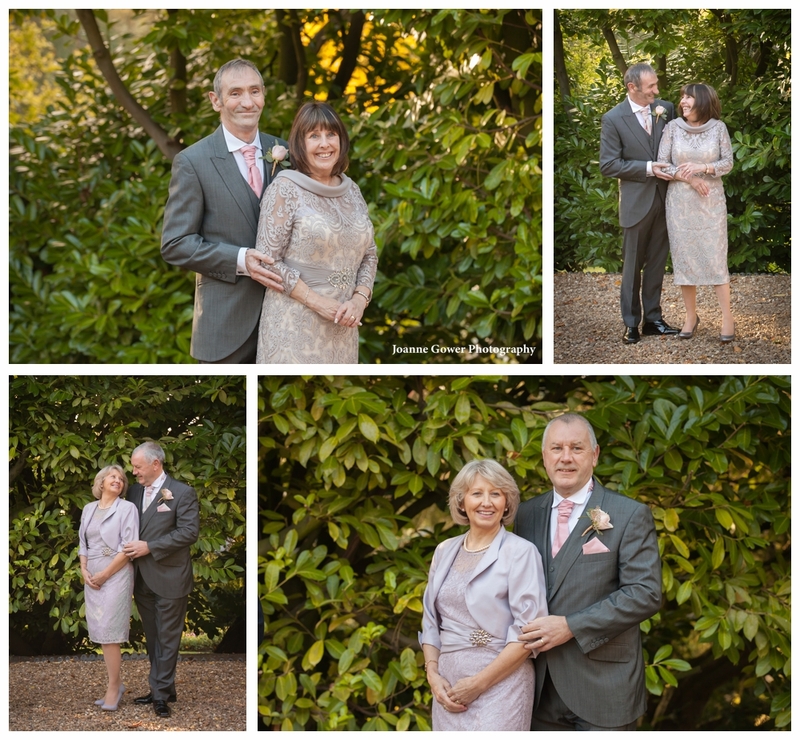 We did however, manage to grab a few minutes with them before the ceremony to capture a small number of formal portraits. 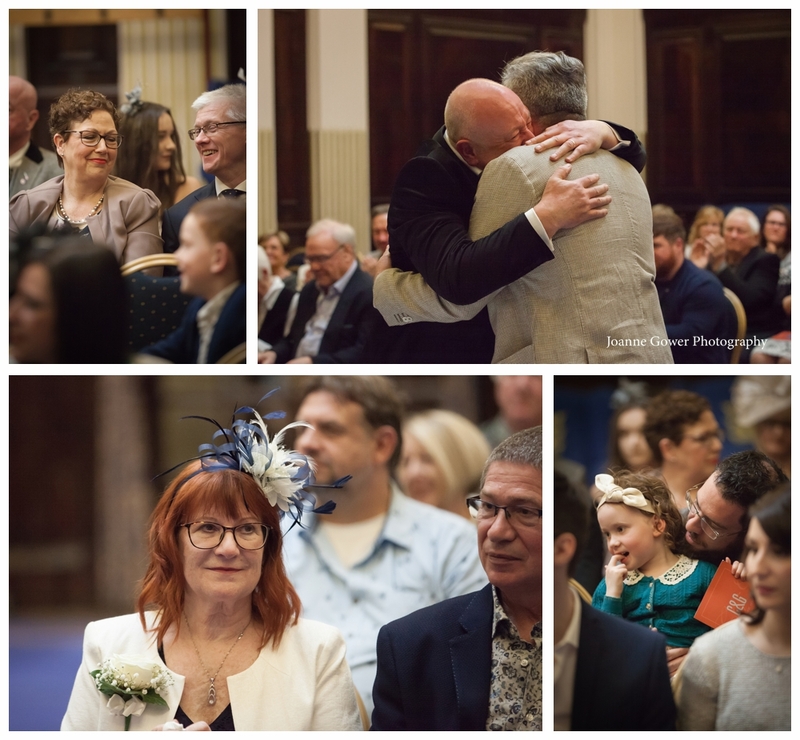 The couple were escorted down the aisle by sisters Barbara and Sheila whilst the congregation of family and close friends looked on. 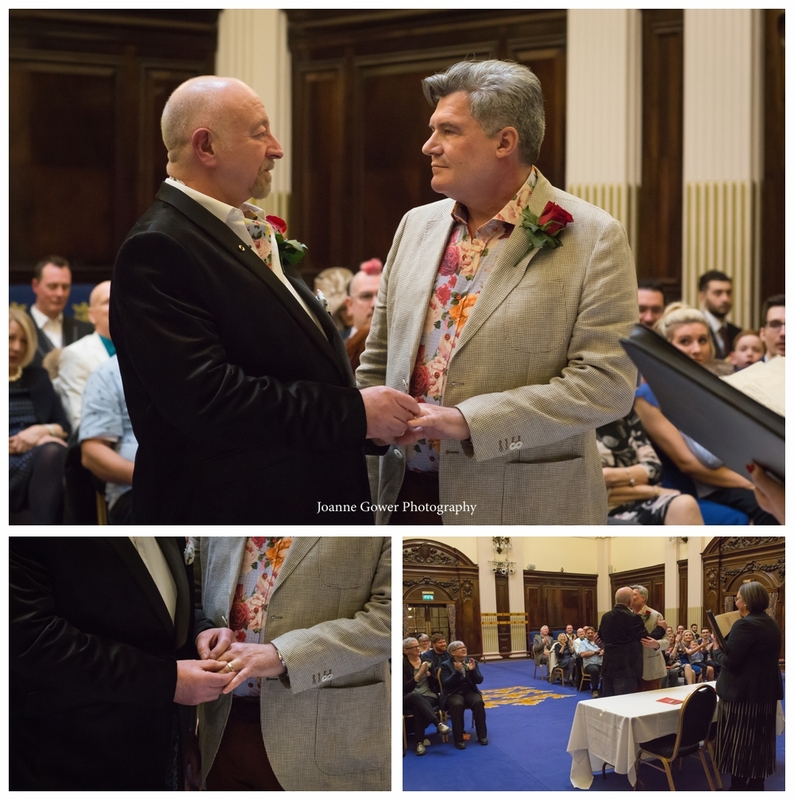 The boys friend Emma gave a heartfelt reading before Colin and Graham read out their personal vows to each other. 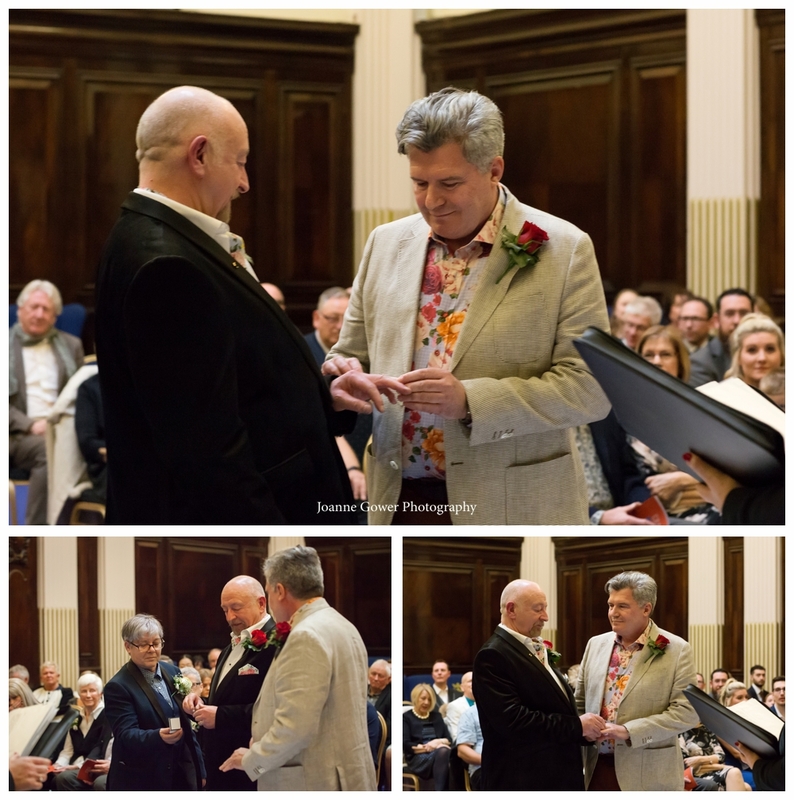 Best woman Tish delivered the rings, and after the exchange the happy couple signed the register, before heading outside for the walk to Humber Street Gallery where they held their reception. 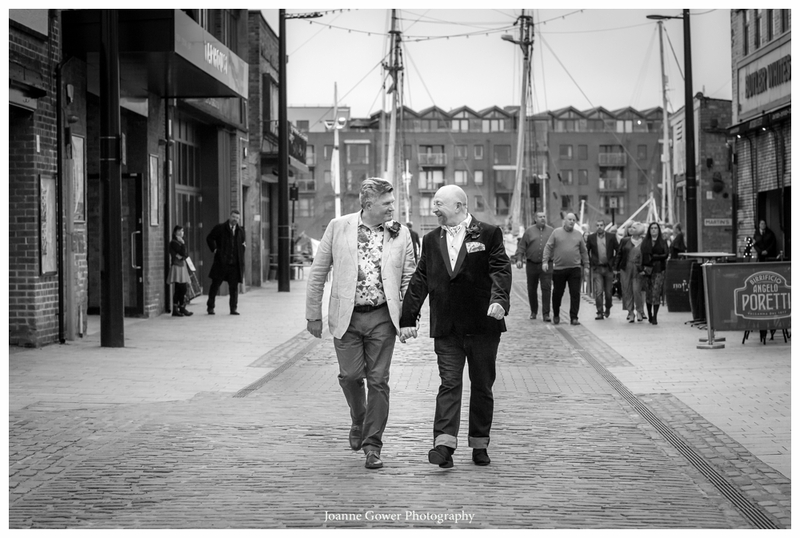 Galloping along the pavement with two cameras whilst avoiding startled pedestrians proved to be a bit of a challenge for David and I, but it was worth the effort as we manage to capture some lovely candid images of the couple and their guests. 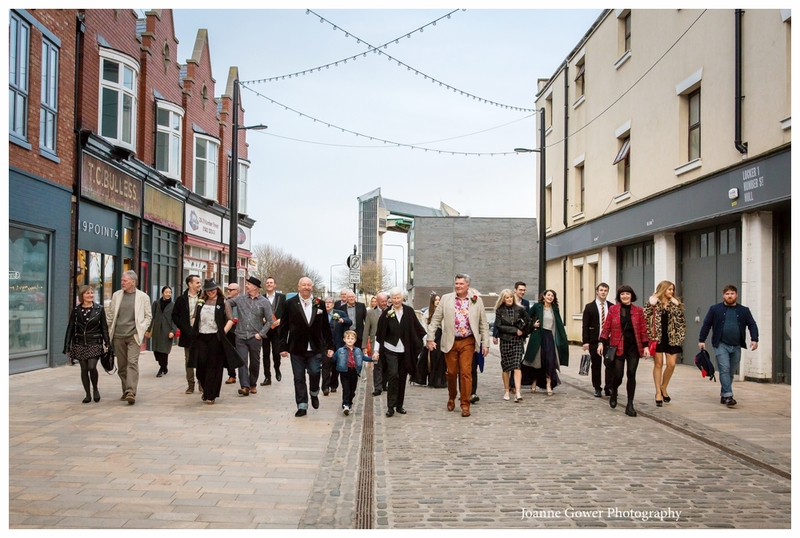 Passers by offered their congratulations before everyone headed into the gallery for a celebratory drink. 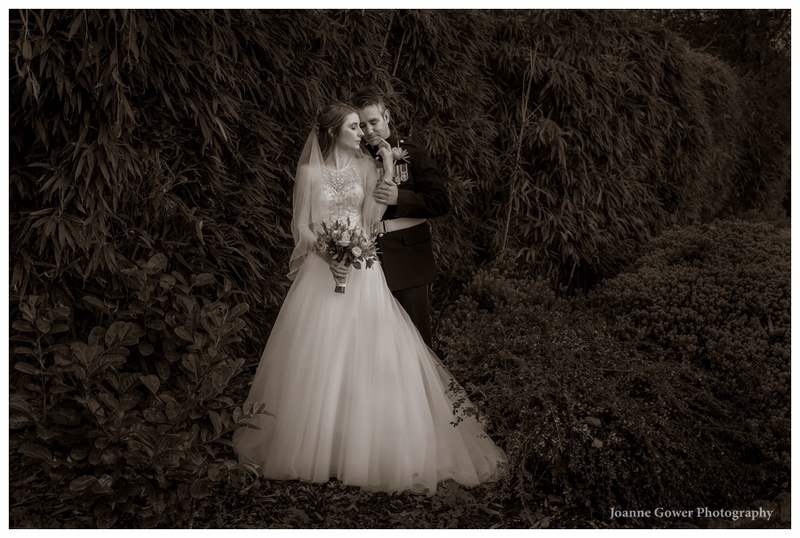 This assignment was a little different from our usual weddings in as much as we pretty much documented things as they happened. 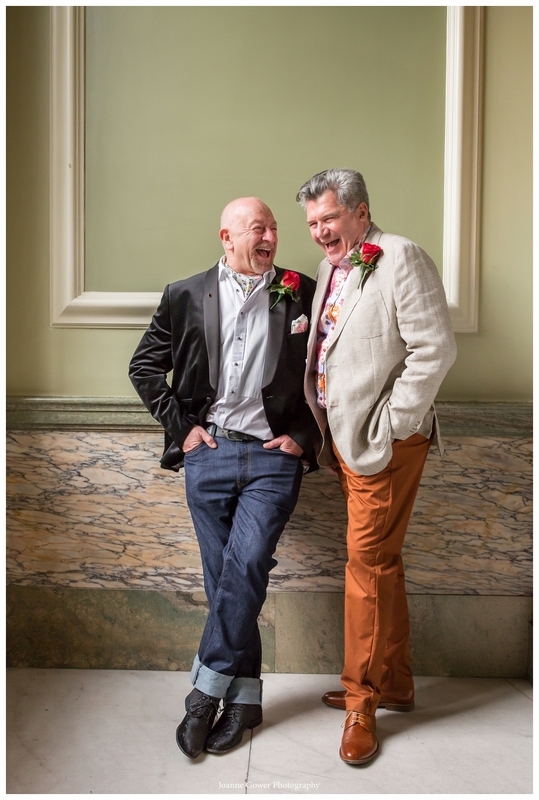 However, it was a huge amount of fun and we had lots of laughs with Colin and Graham. 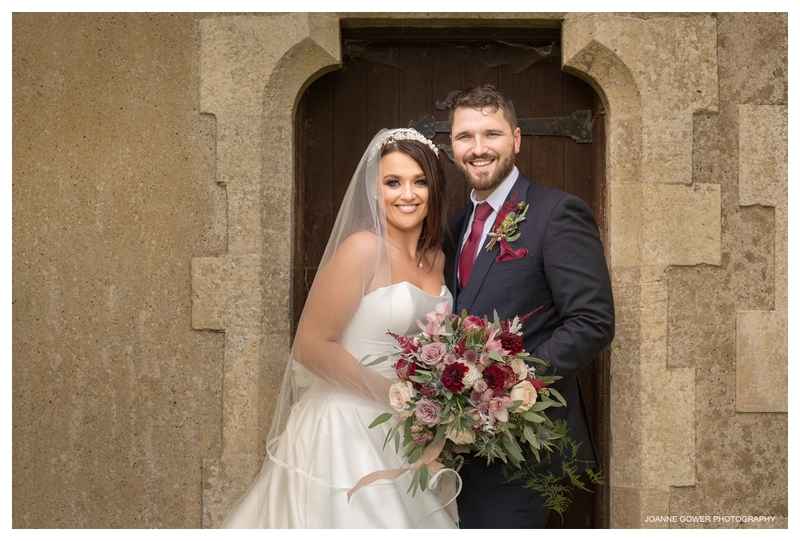 We wish them lots of love and happiness in their future life together and look forward to sharing the rest of their wedding photographs with them soon. 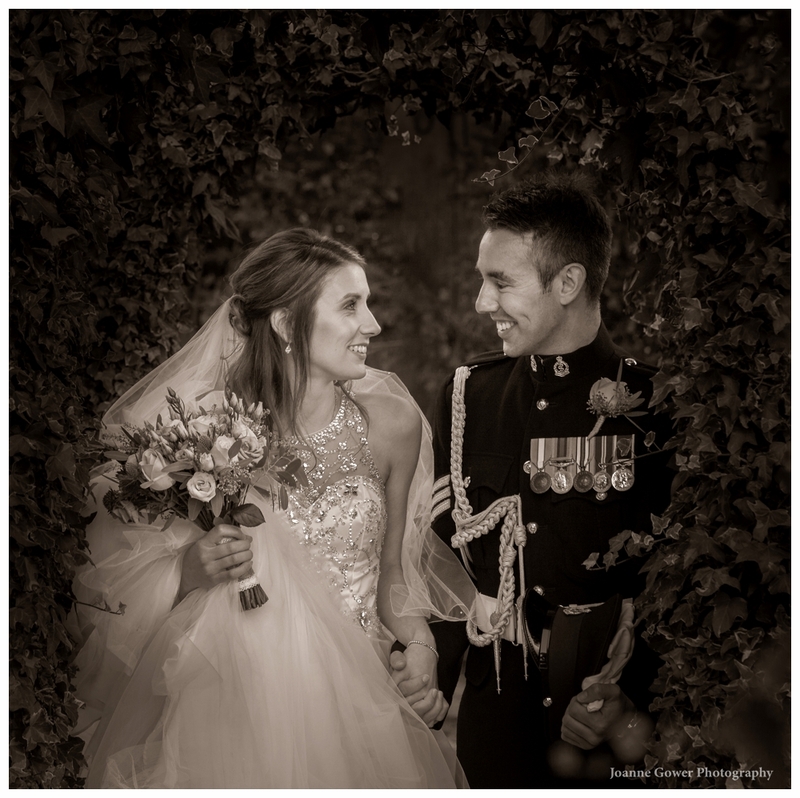 I am delighted to share the preview wedding photography for Victoria and Jospeh, who were married on Friday at Crab Manor, near Thirsk. 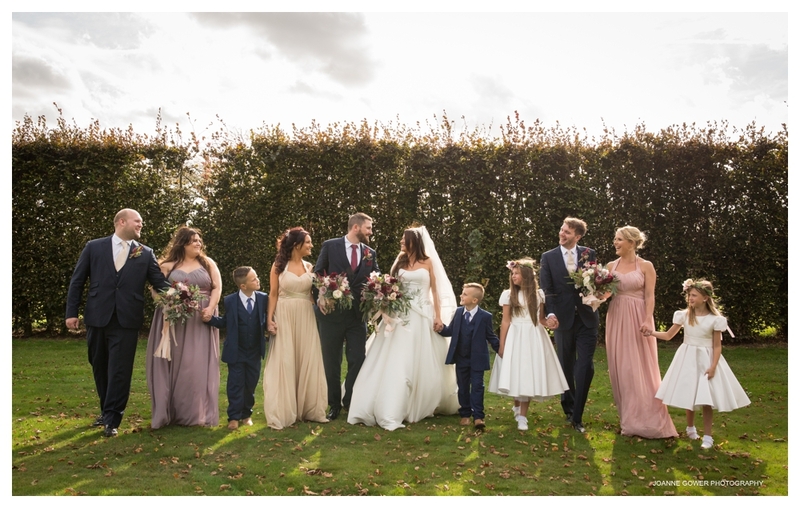 This was our final wedding of 2018 and what a lovely way to finish. 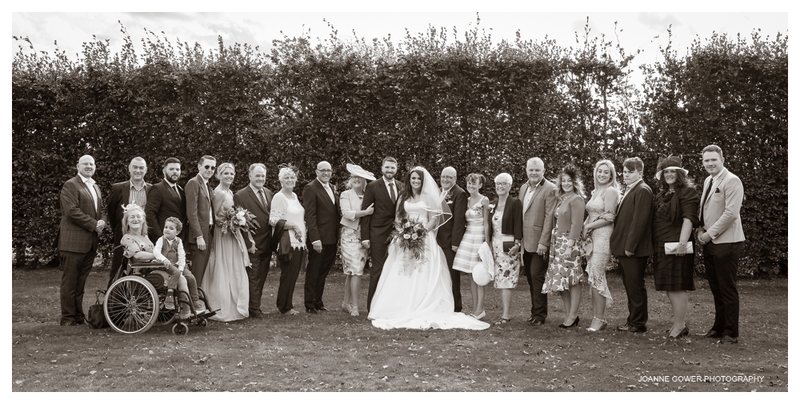 We had a truly wonderful day with this lovely couple and their amazing family and friends. 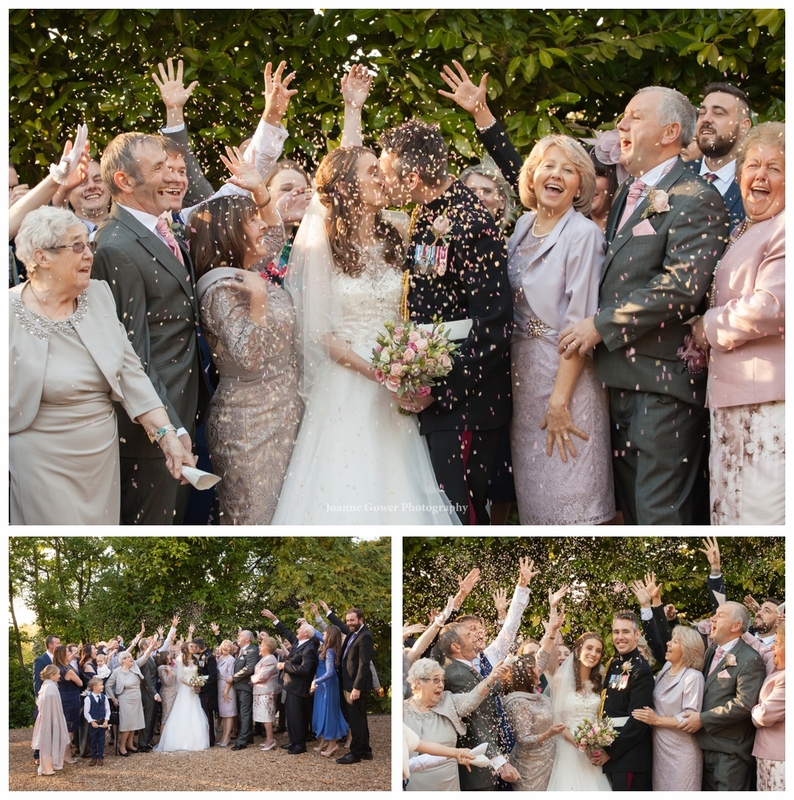 From start to finish the day was full of joy. 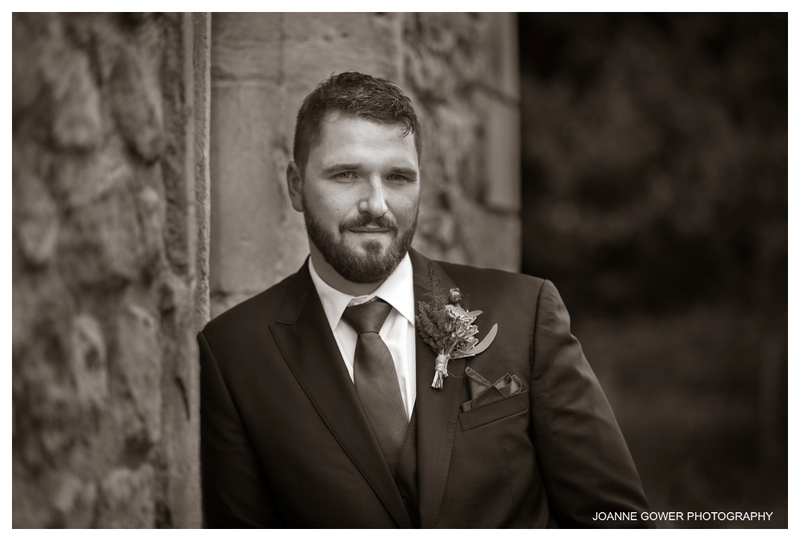 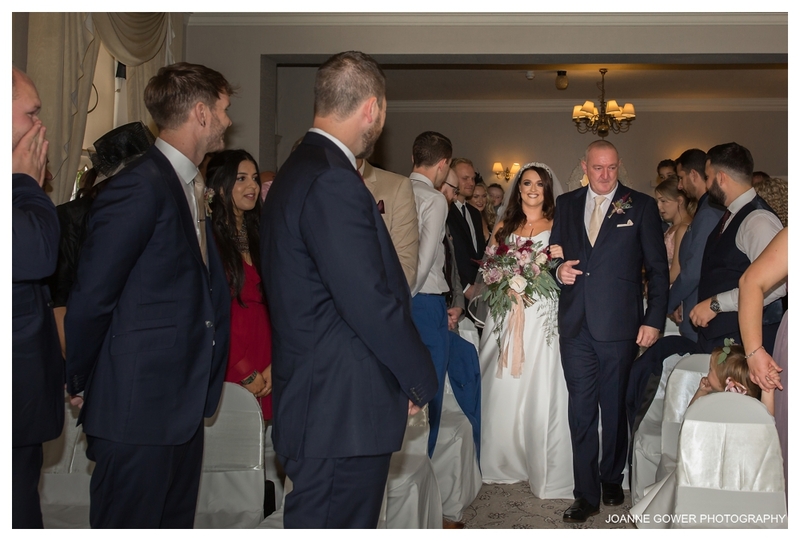 With weddings, I feel that it is the bride who sets the tone for the day, so it is no surprise to say that the day was also elegant, well organised and just a total pleasure to be part of. 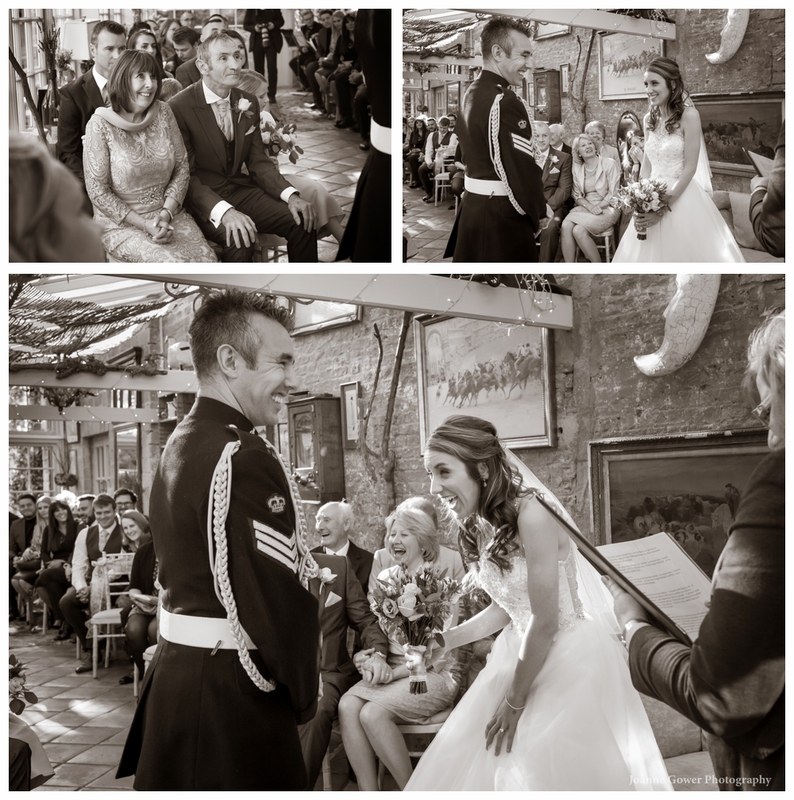 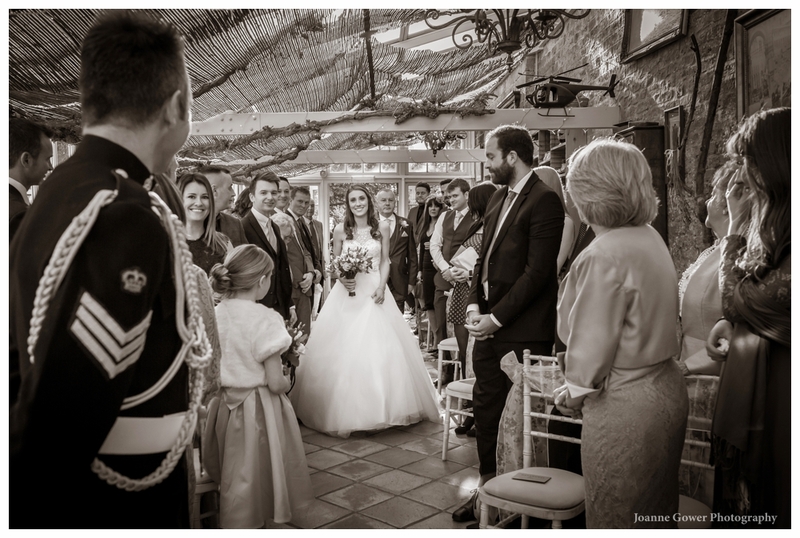 As it was November and we were uncertain of how the weather might behave, Victoria and Joseph had opted to have an early morning reveal, rather than choose the traditional option of the groom seeing his bride for the first time when she comes down the aisle. 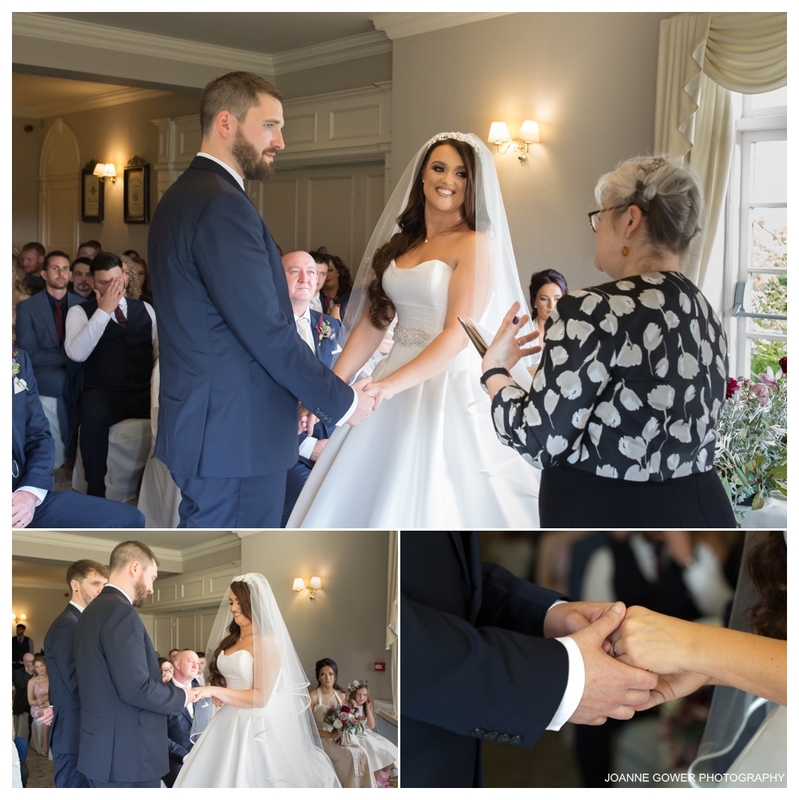 I have to say that this afforded this couple a very intimate and happy moment as they saw each other for the first time, and I really love the images that we captured for them during these touching moments. 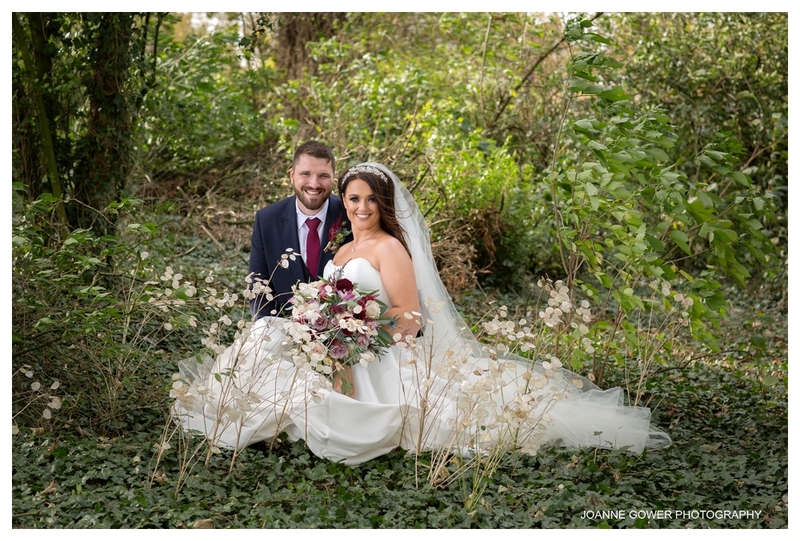 Their decision to have a ‘reveal’ also meant that we were able to do many of their couple portraits before the ceremony took place. 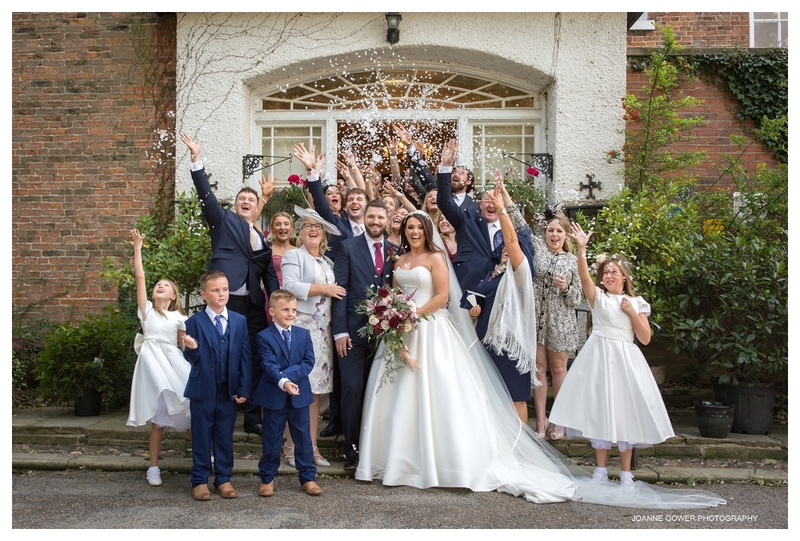 This gave them (and us), a very relaxed experience, and as the weather was so beautiful, we were able to make the most of the beautiful gardens at Crab Manor. 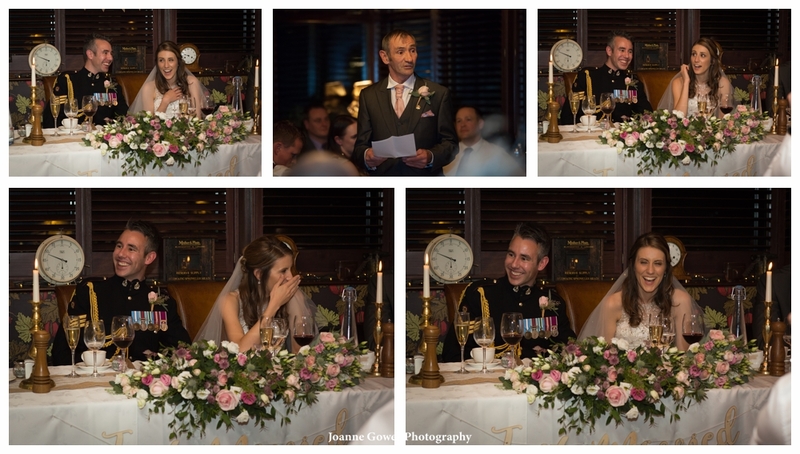 The ceremony took place at 1.30pm and there were a few laughs when Jospeh mixed up his words! 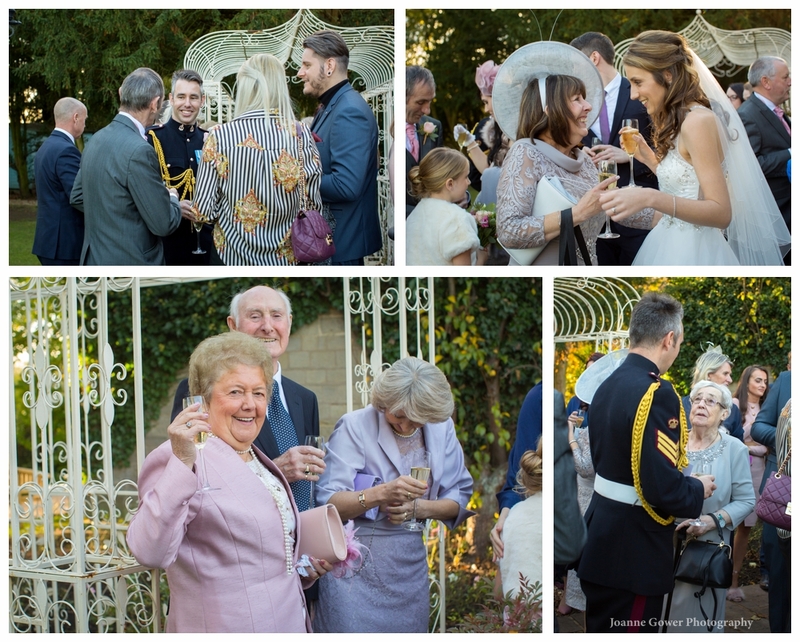 Following the service, guests enjoyed a celebratory drink outside the conservatory, before joining us for the formal family photographs. 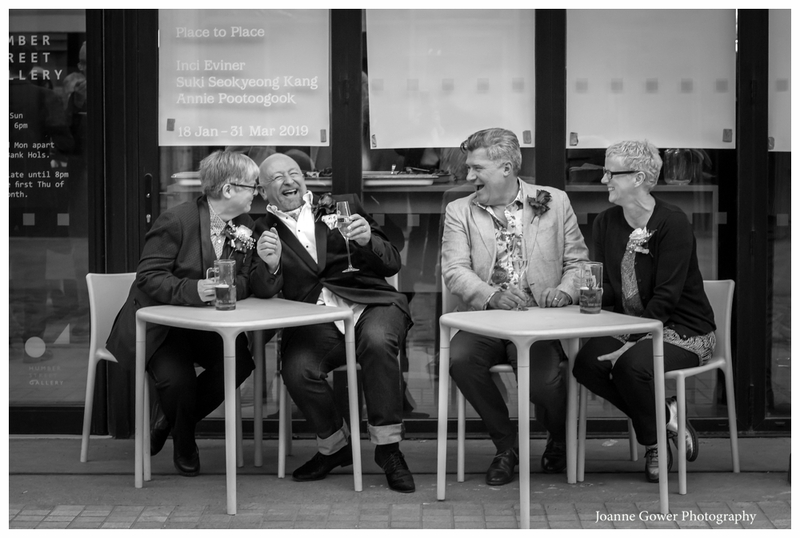 We had many laughs with them during this part of the day, and they all made our job very easy with their good humour. 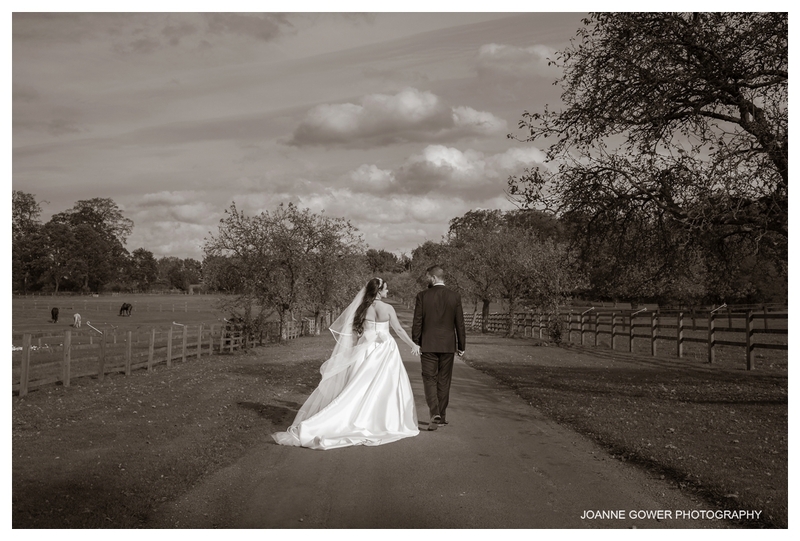 We had a totally amazing day with Victoria and Joseph, finishing the day as relaxed as we started it. 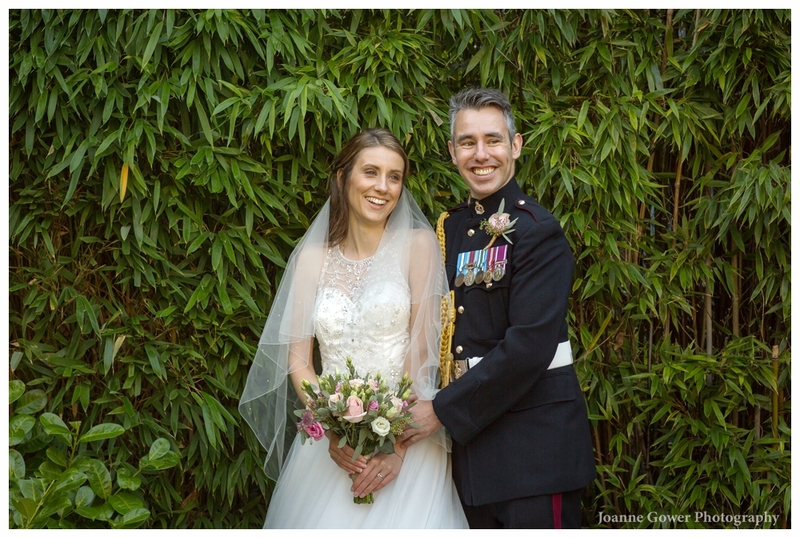 This is probably a first for us and down to the good grace and organisation of this beautiful couple. 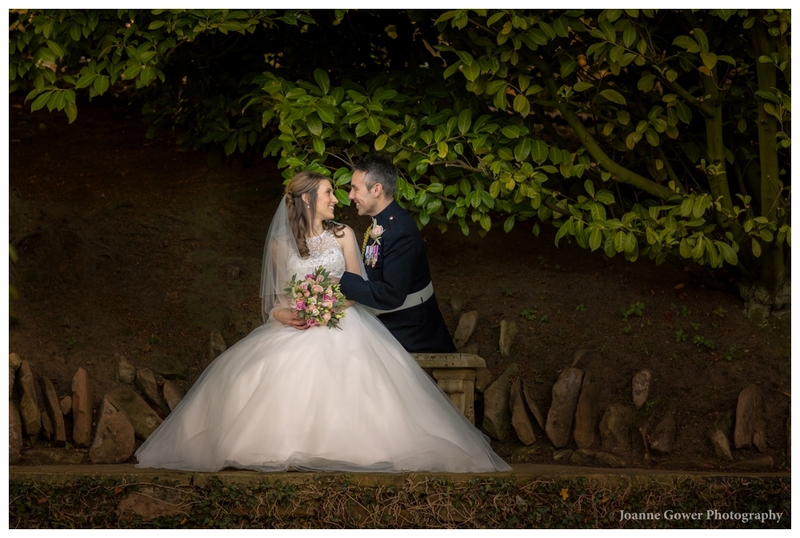 We wish them a very happy future together and look forward to sharing the rest of their wedding photography with them very soon! 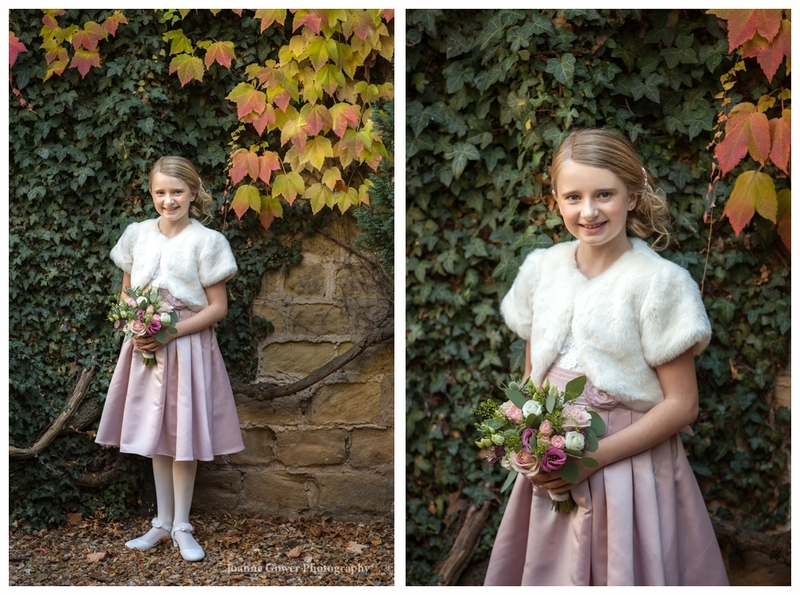 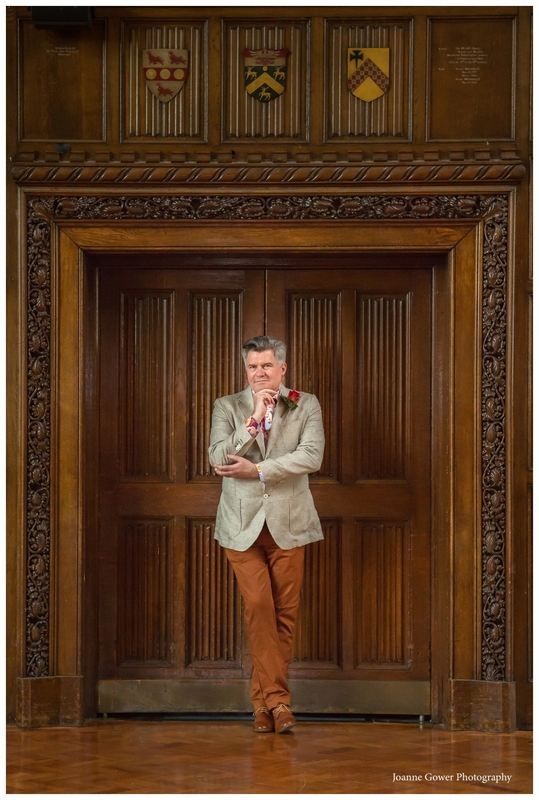 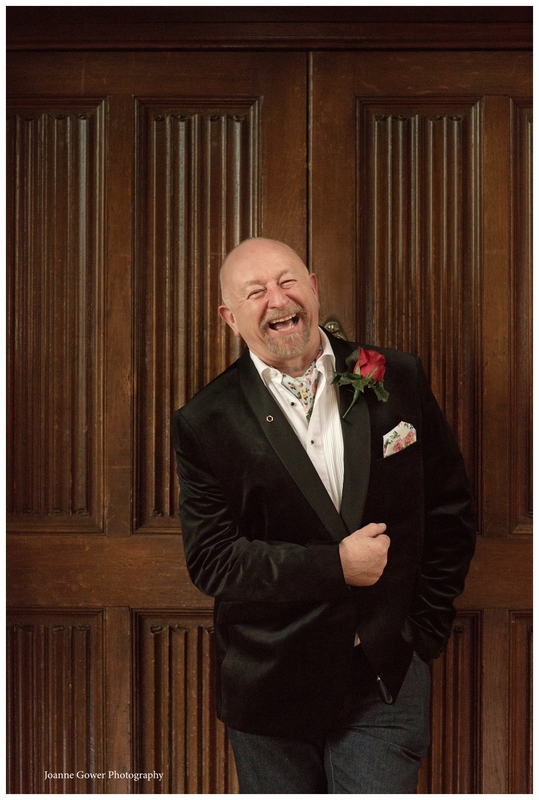 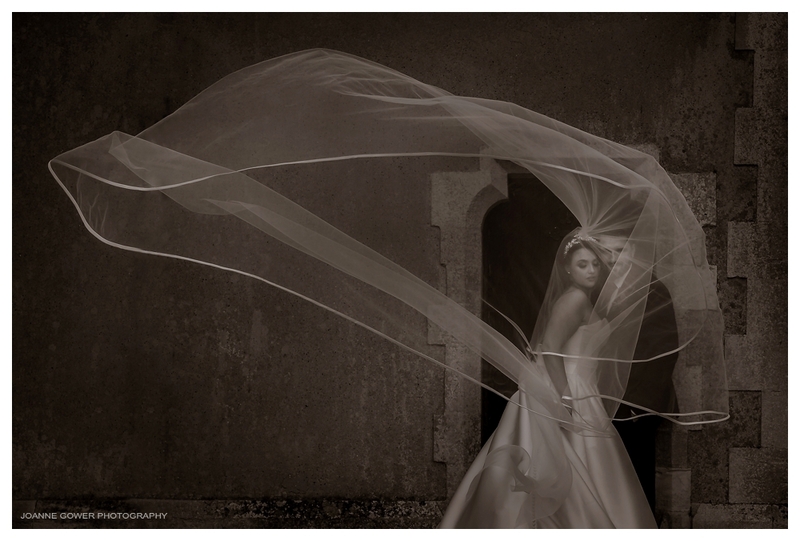 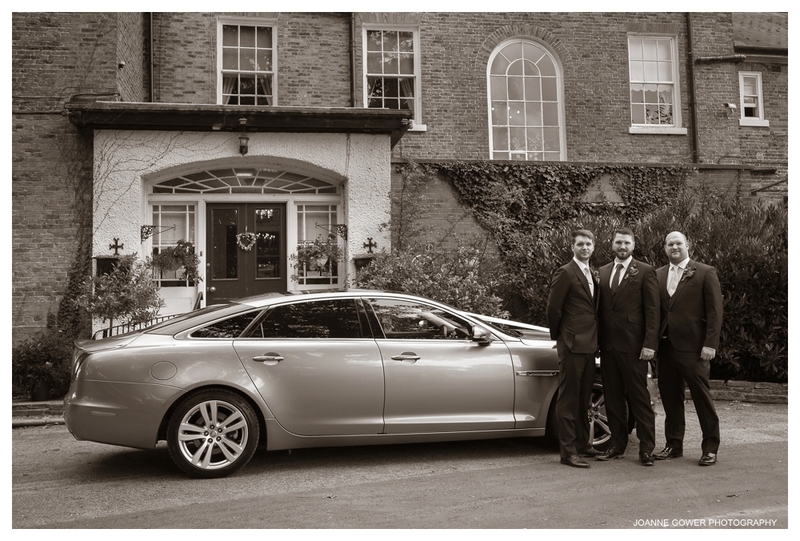 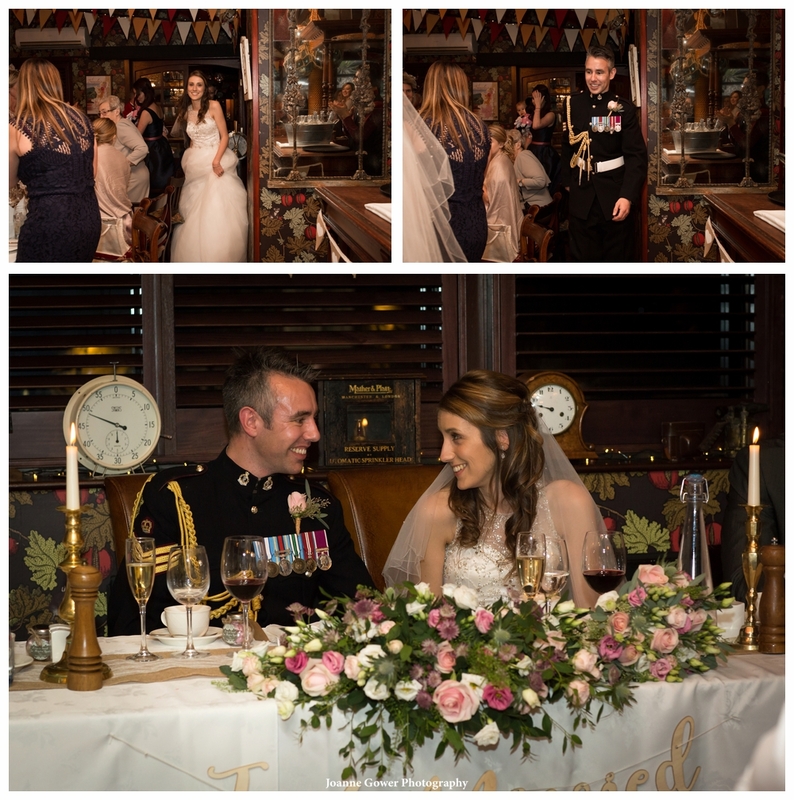 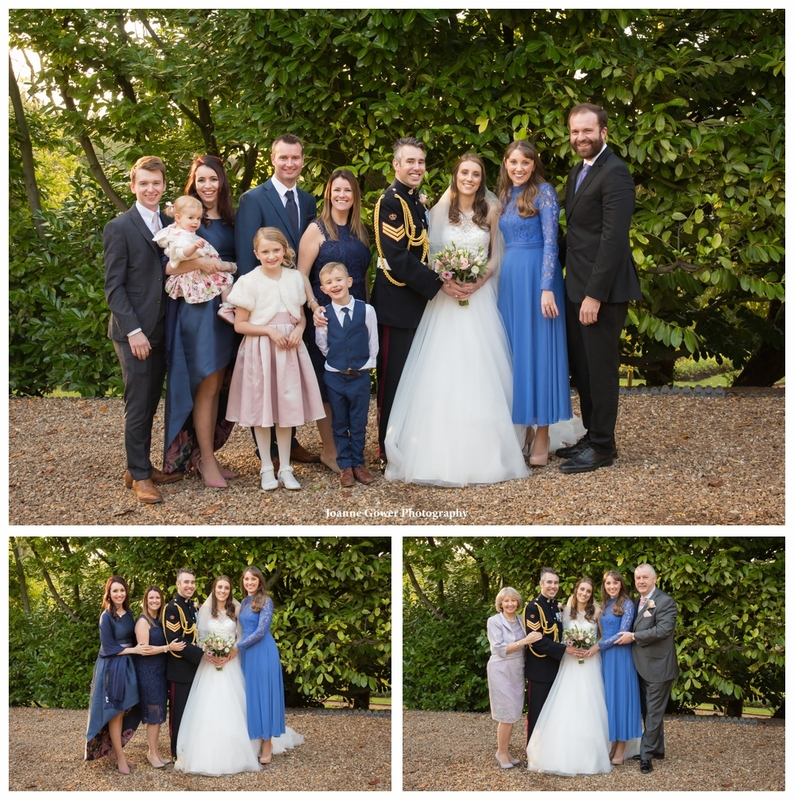 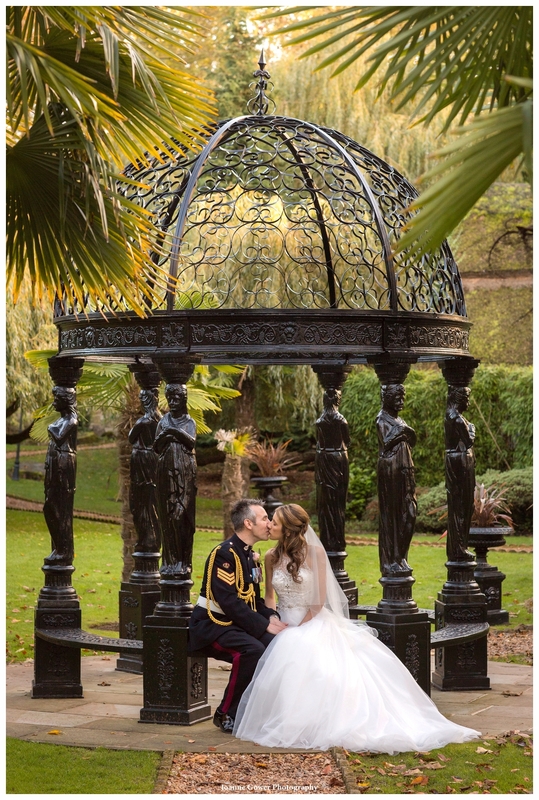 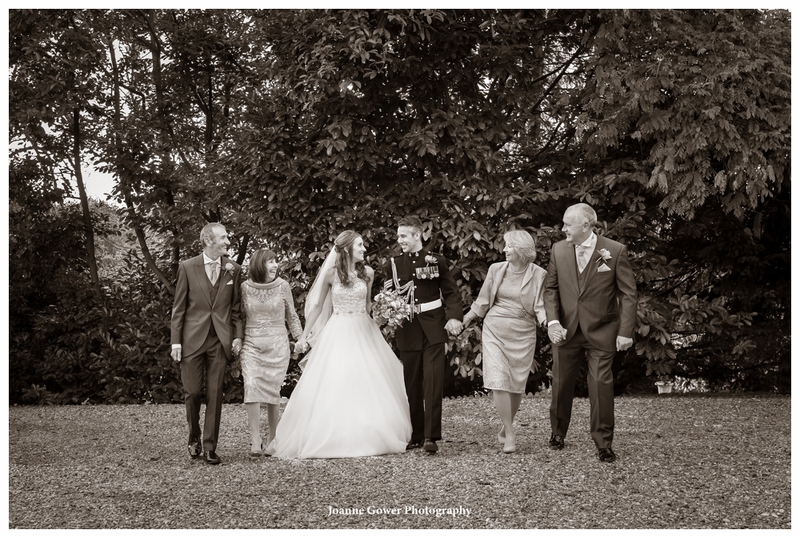 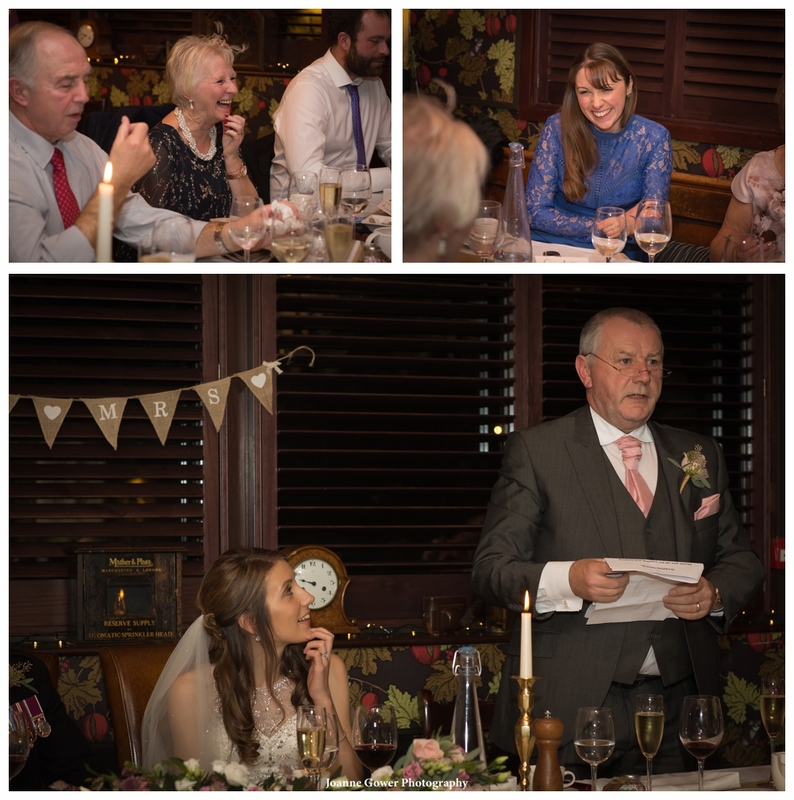 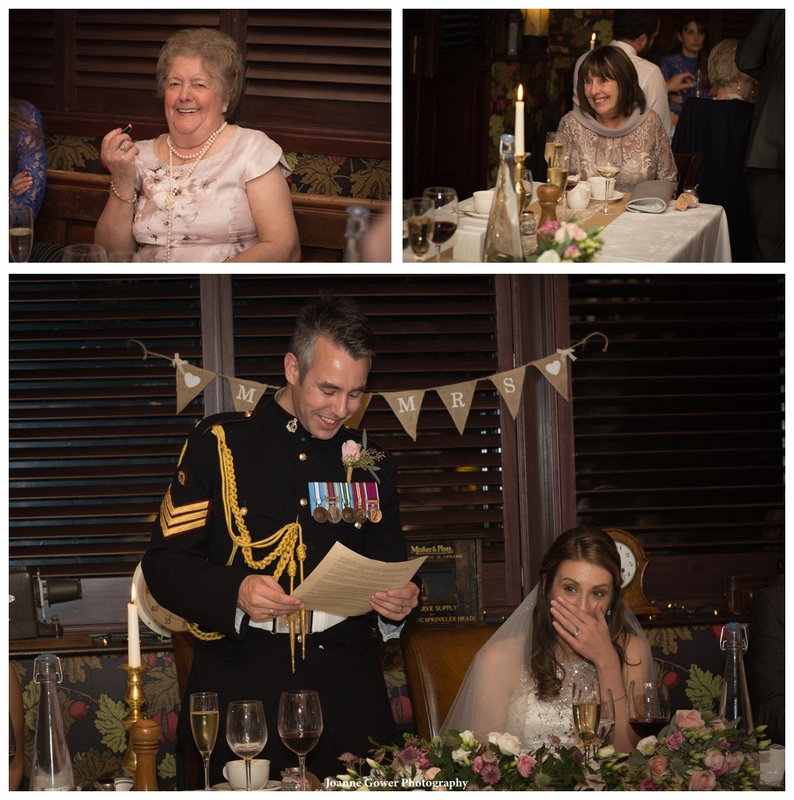 As Father of the Bride (Victoria) we are delighted with the Photos on this Blog. 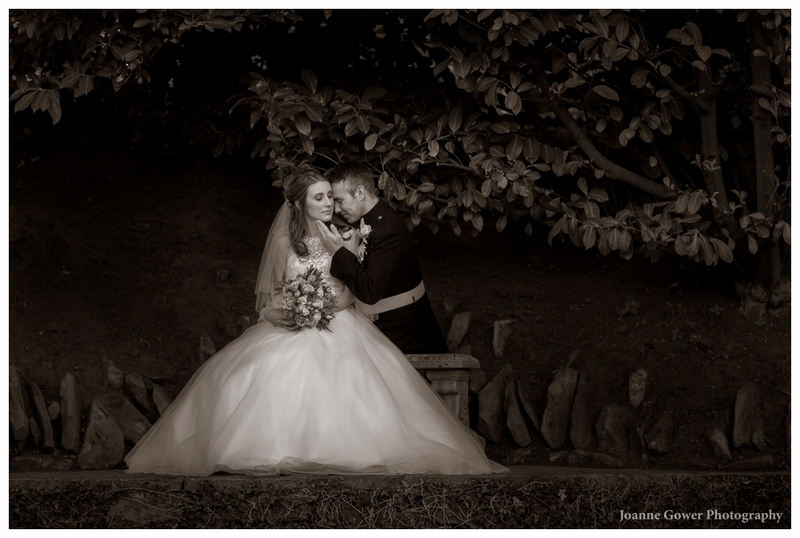 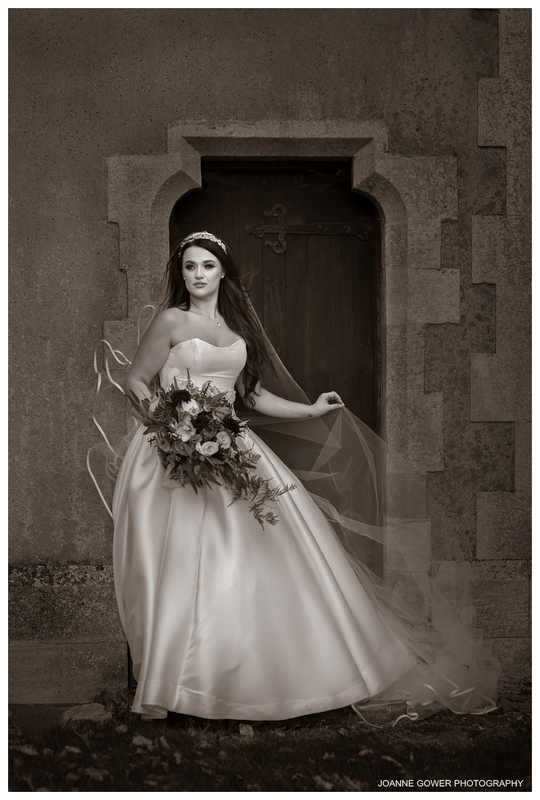 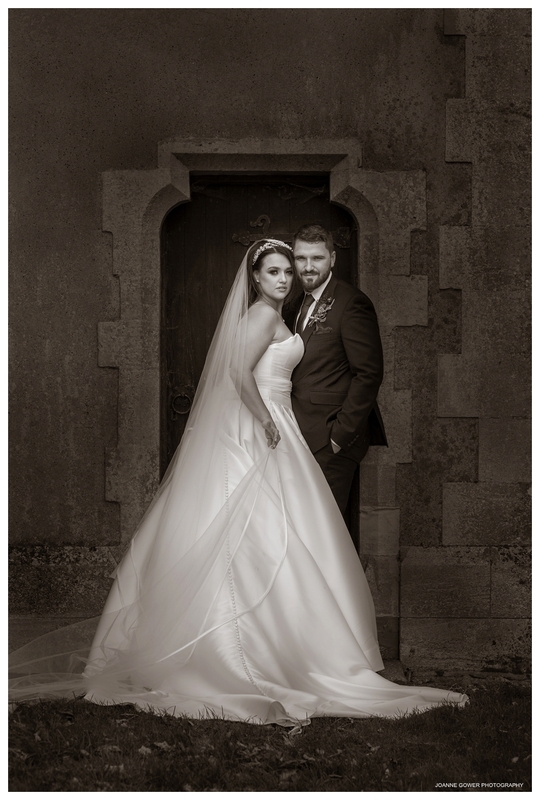 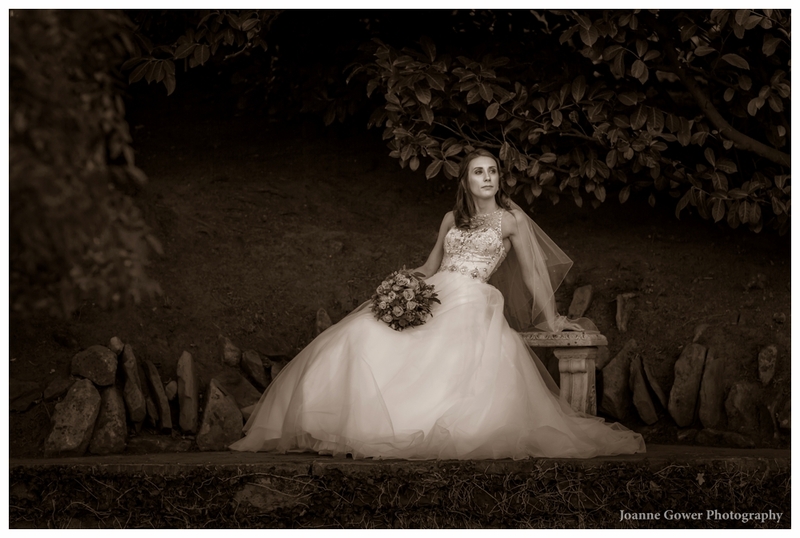 Victoria and Joe were very fortunate to get you as the Photographer. 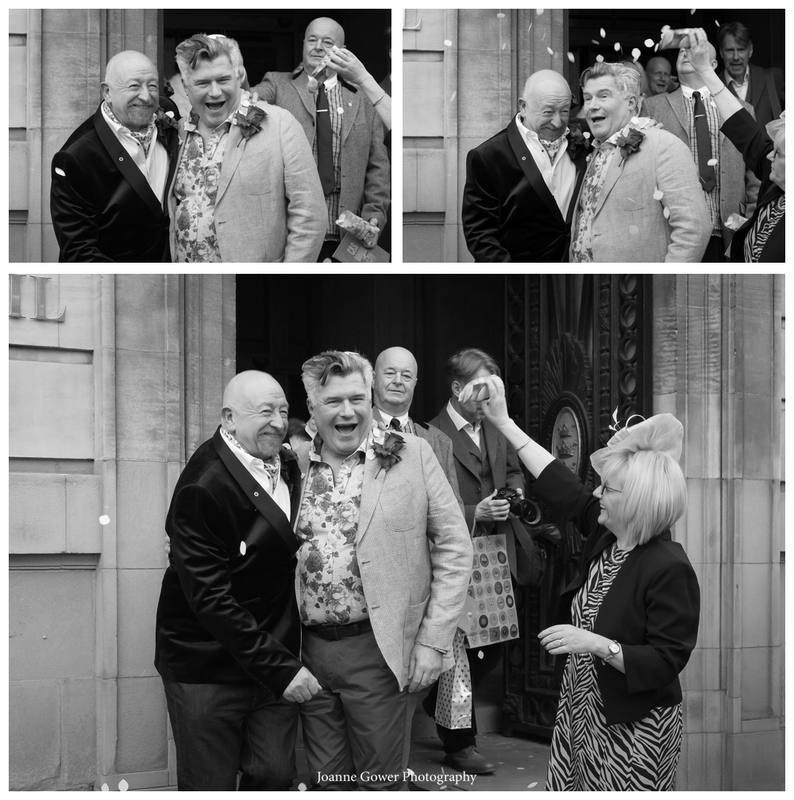 These are by far the best photographs I have seen from any wedding. 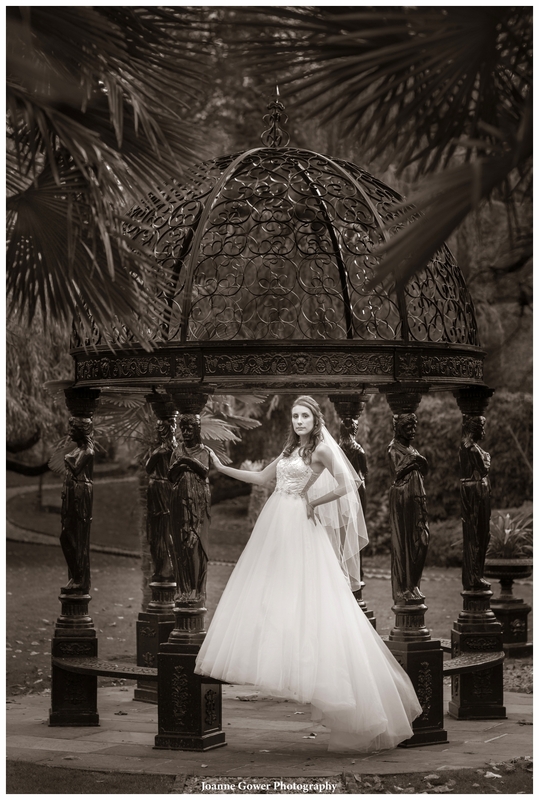 A First class Photographer creating World standard photographs. 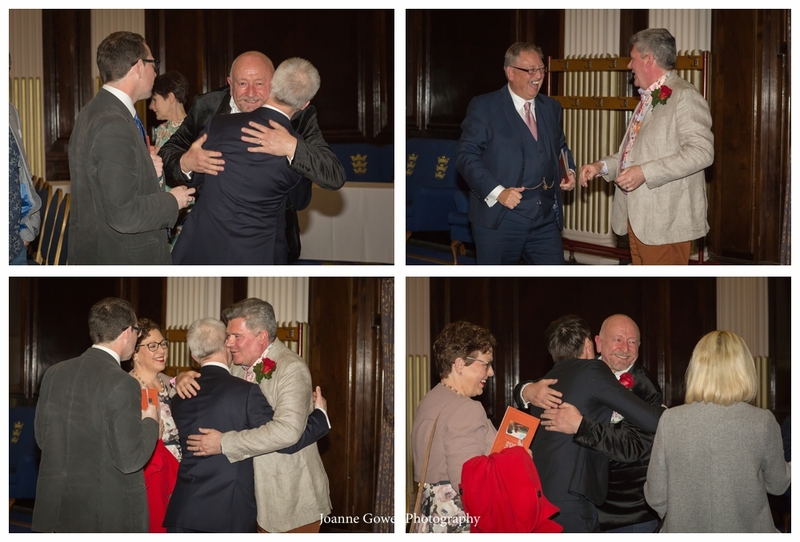 You worked the subjects well with good humour and professionalism. 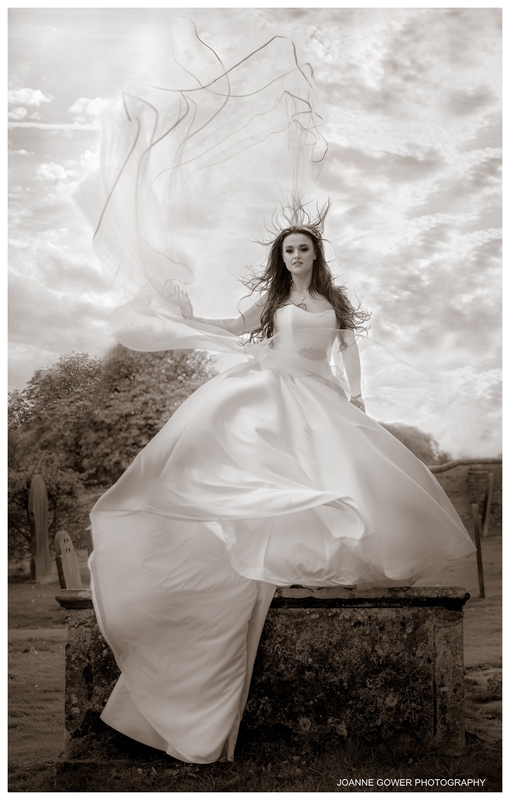 We cannot wait for the whole album. 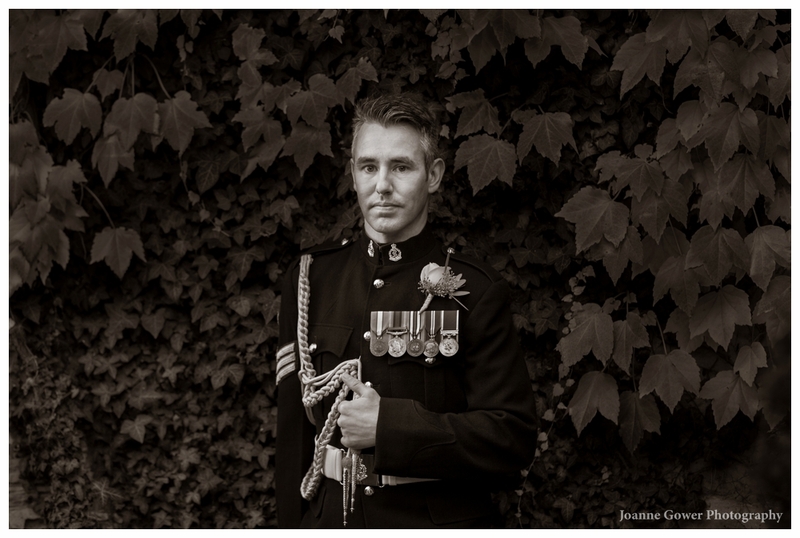 Thank you for your excellent work. 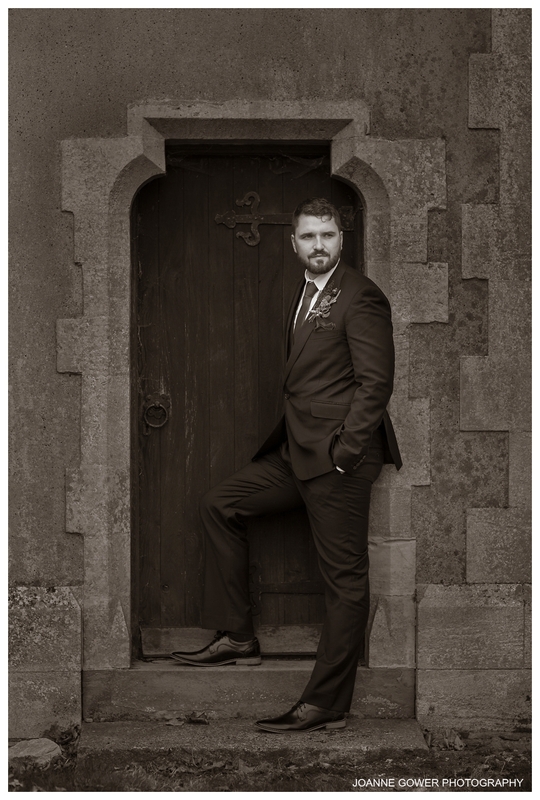 Hello Patrick. 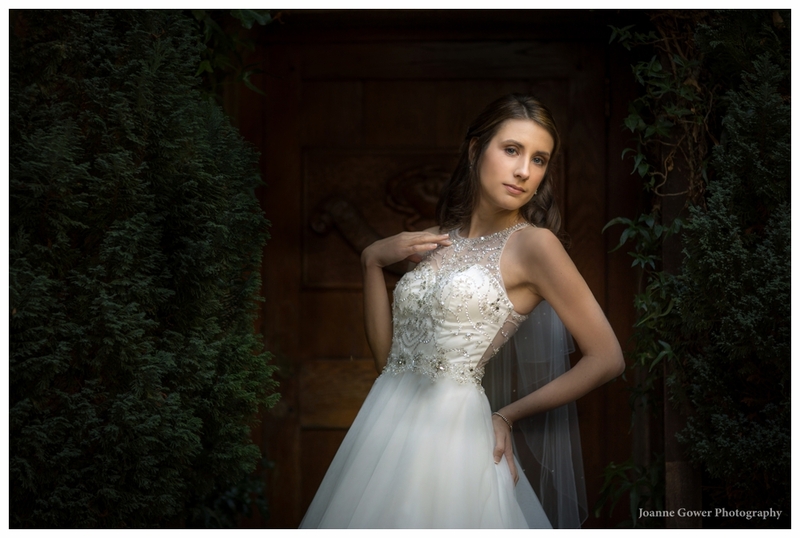 Thank you so much for this lovely review! 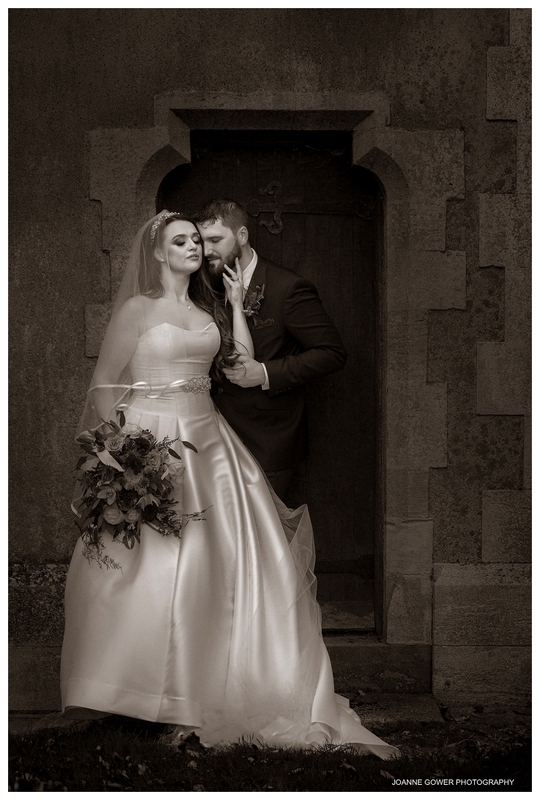 It means a great deal to us and we are delighted that you are happy with the images and our approach. 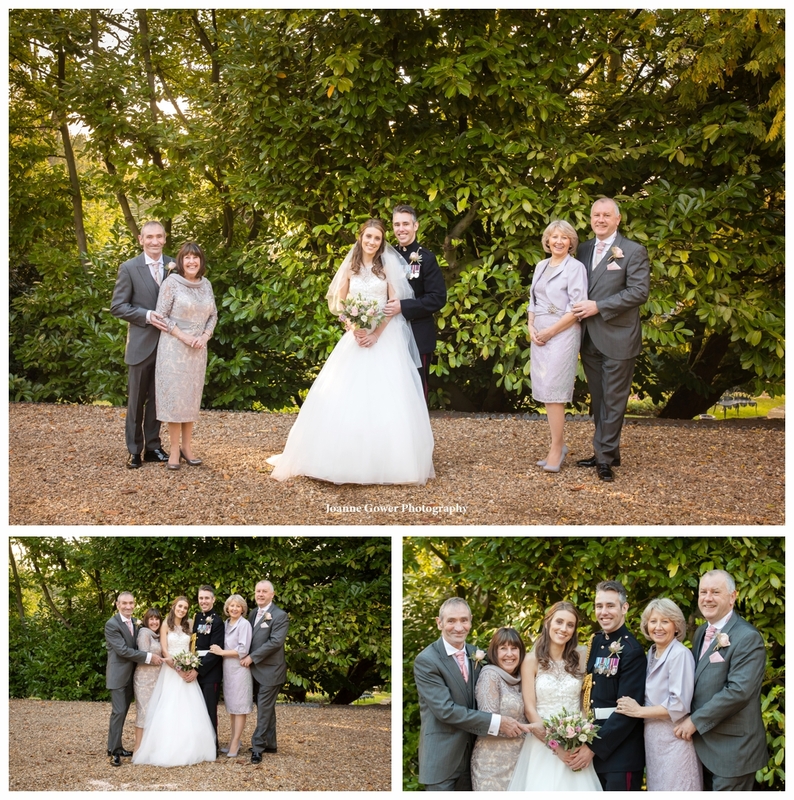 It was certainly a beautiful wedding and we are very proud to have played a part in your special day! 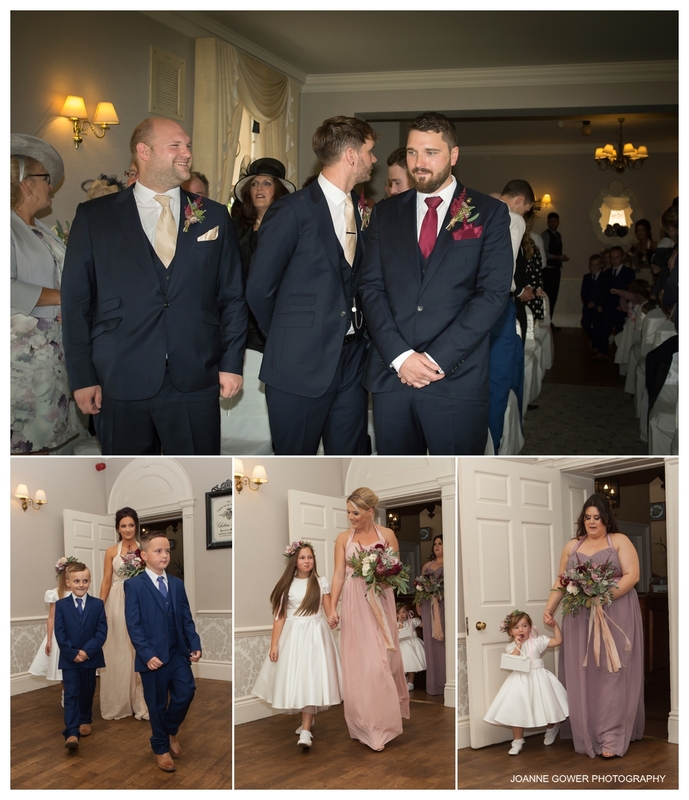 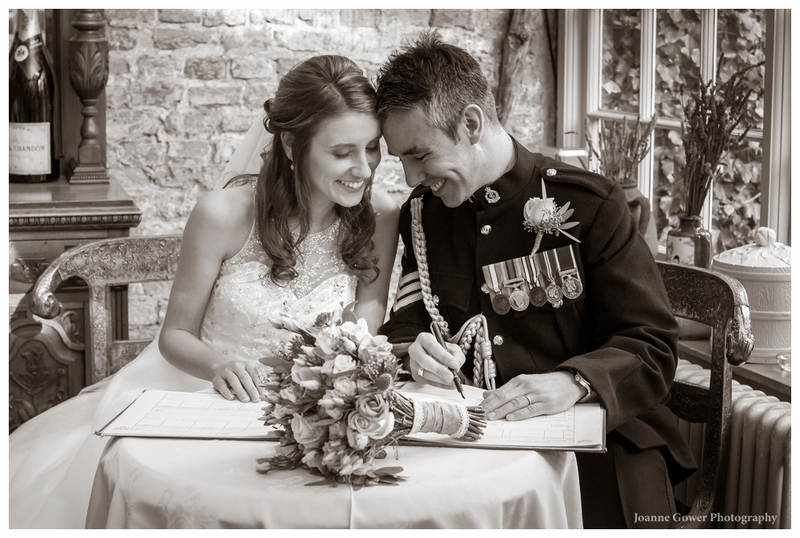 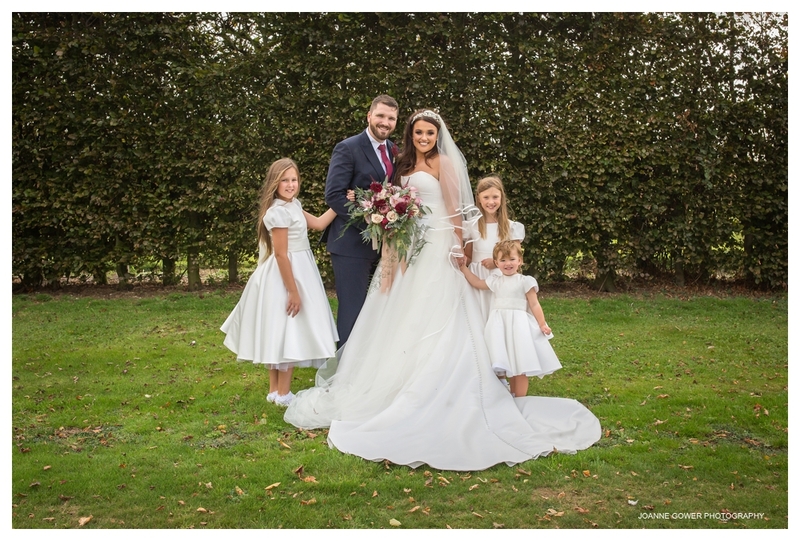 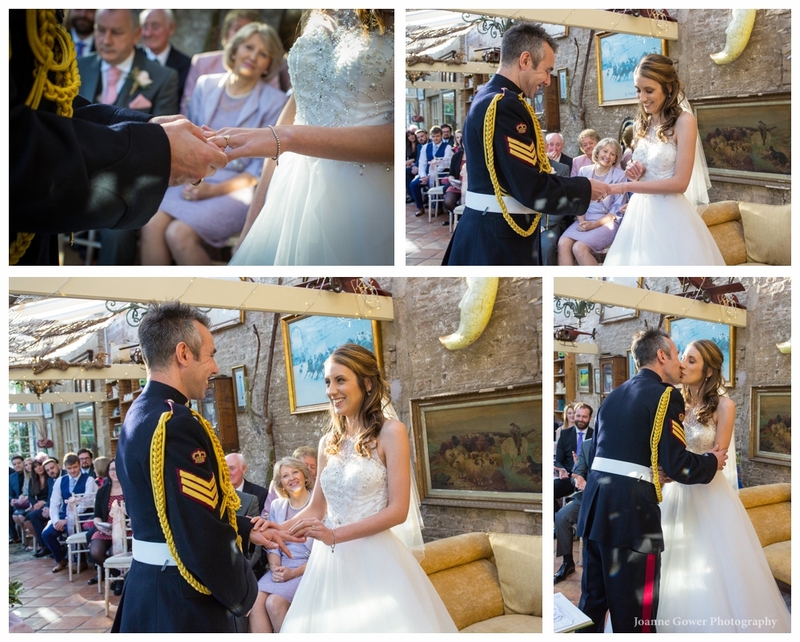 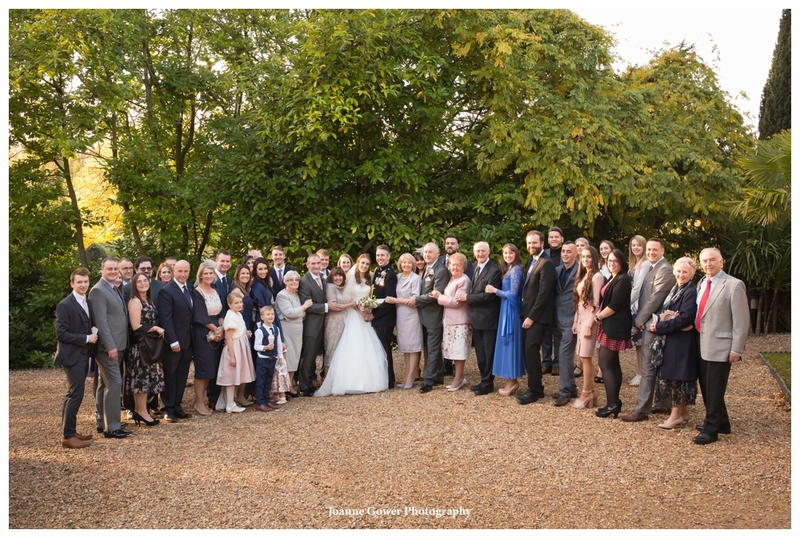 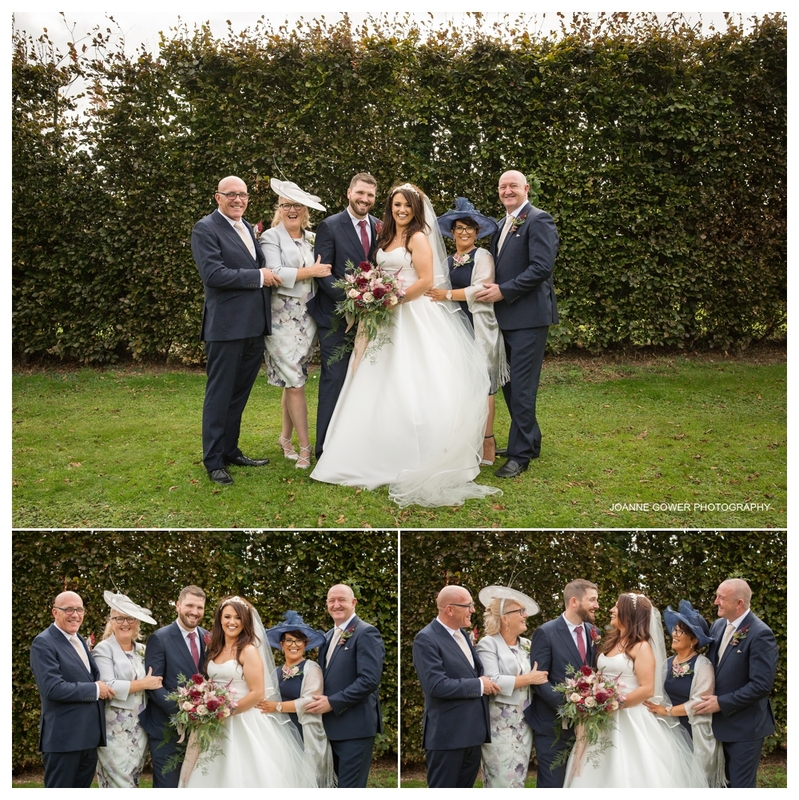 I am delighted to share the preview wedding photography for Rebecca and Same who were married on Saturday on an exceptionally windy day at Rowley Manor, Little Weighton, East Yorkshire. 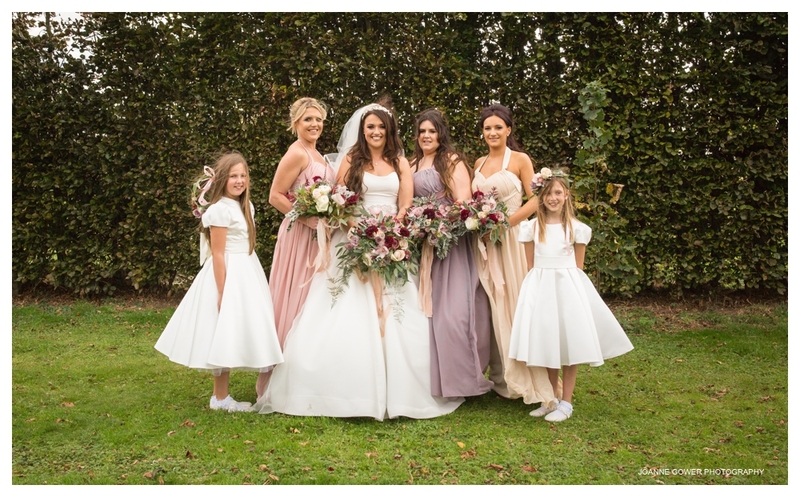 We started the day in the beautiful bridal suite at Rowley, where Rebecca was busy getting ready with bridesmaids Sophie, Kristie, Lucy, Ella, Poppy and Alice. 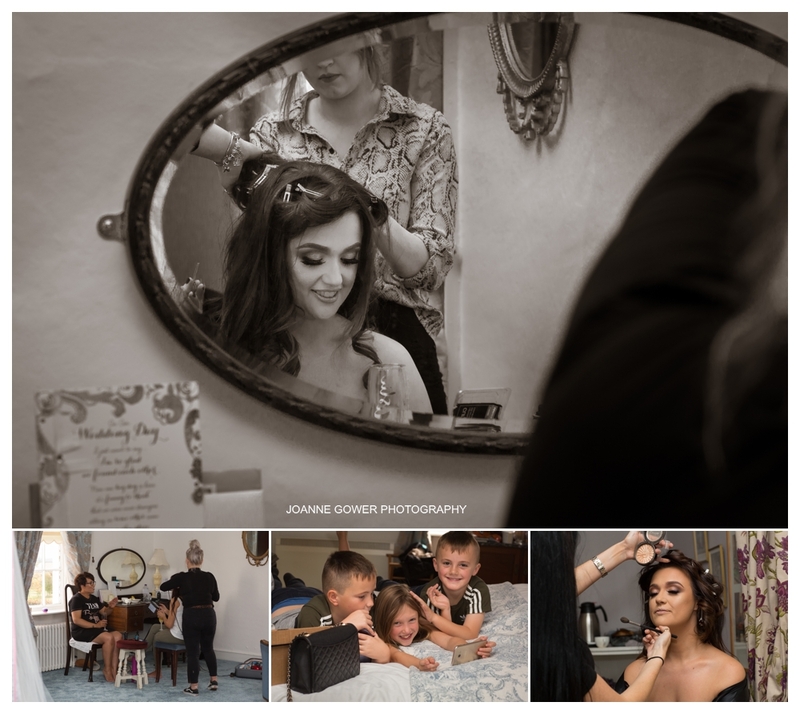 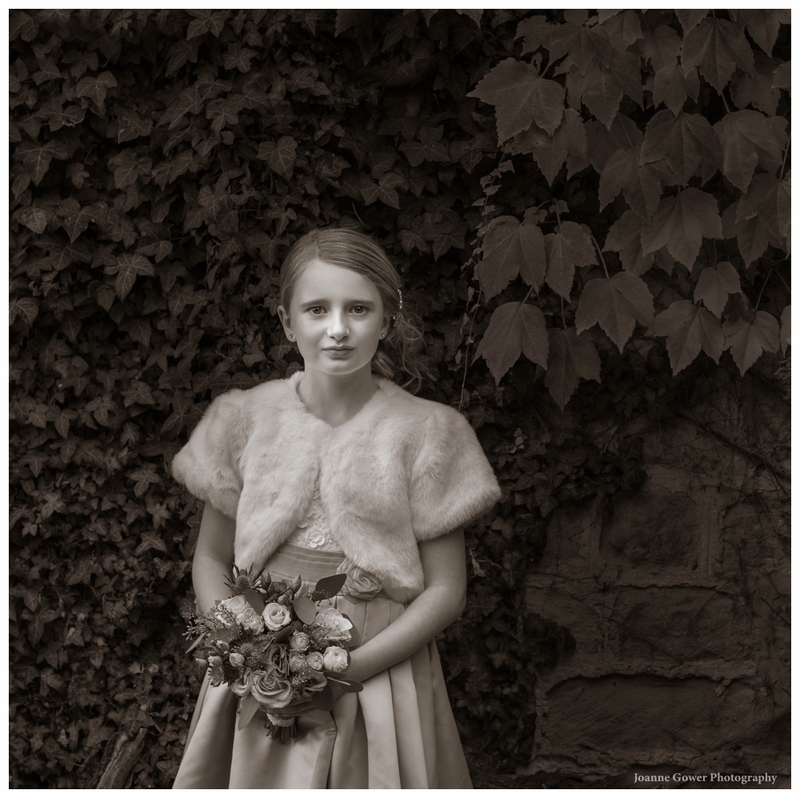 There was a lovely atmosphere whilst Rebecca was having the finishing touches done to her make up, and we photographed her stunning dress from Deborah Mooore in Hessle. 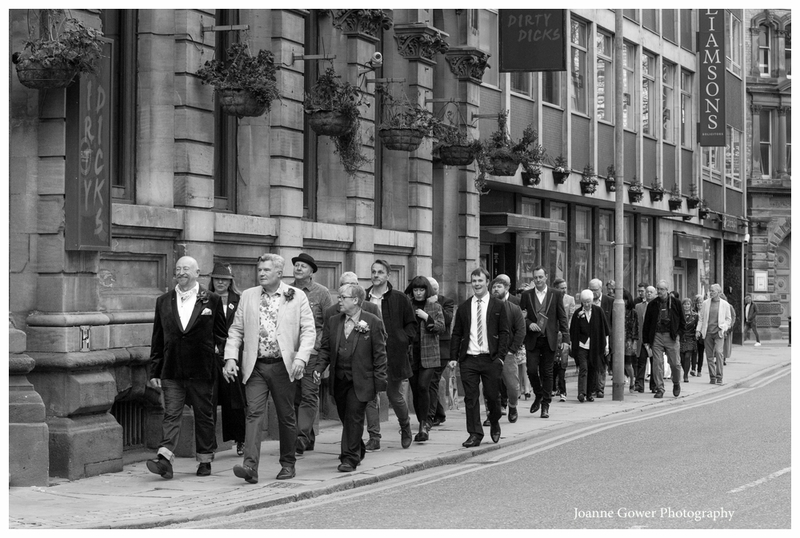 Time moves fast on a wedding day and before long, we were heading downstairs to meet Sam and his best men Dave and Peter. 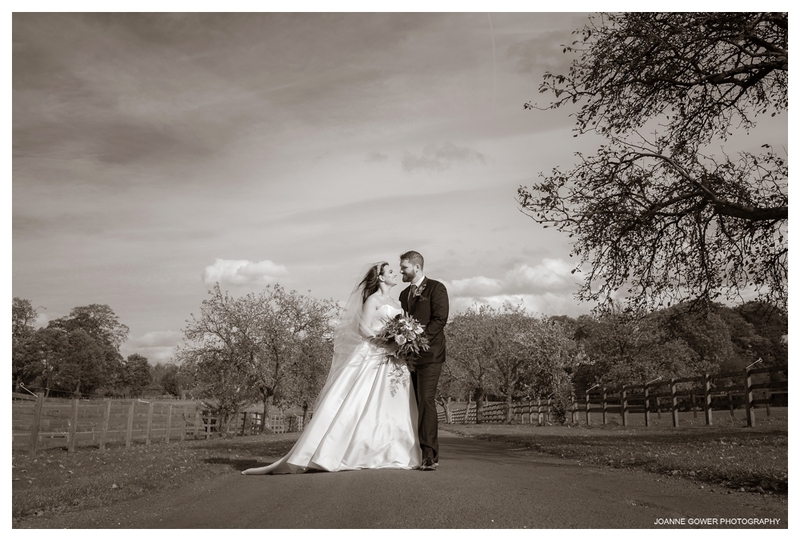 Our job today was made a lot easier as we had already done the wedding of best man Dave and his wife Kerry previously. 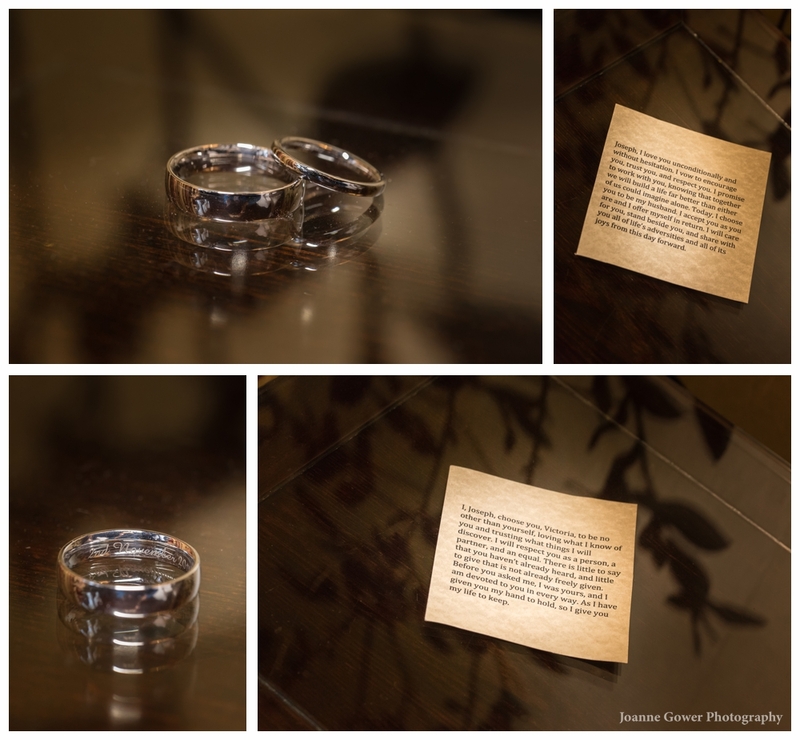 This meant that Sam and Becky were well prepared for what we had in store for them from a photography point of view. 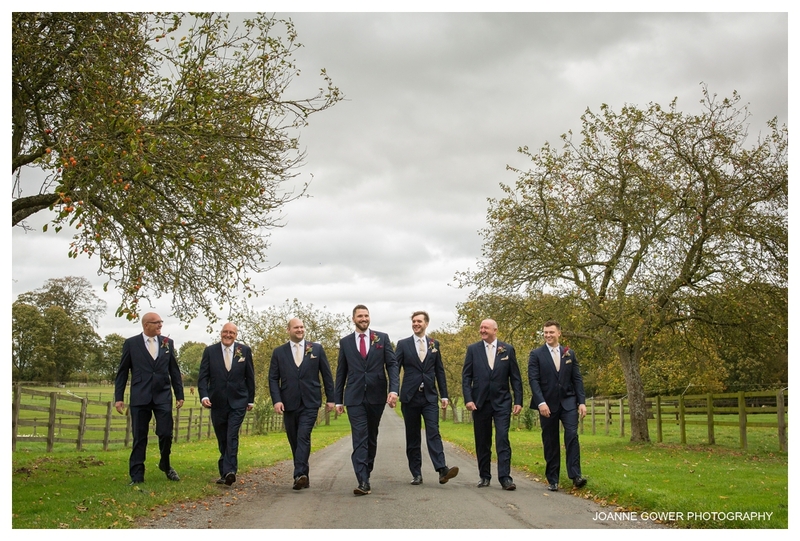 The boys look super smart in their suits from Slaters and as the weather was dry, we headed outside to get some photographs. 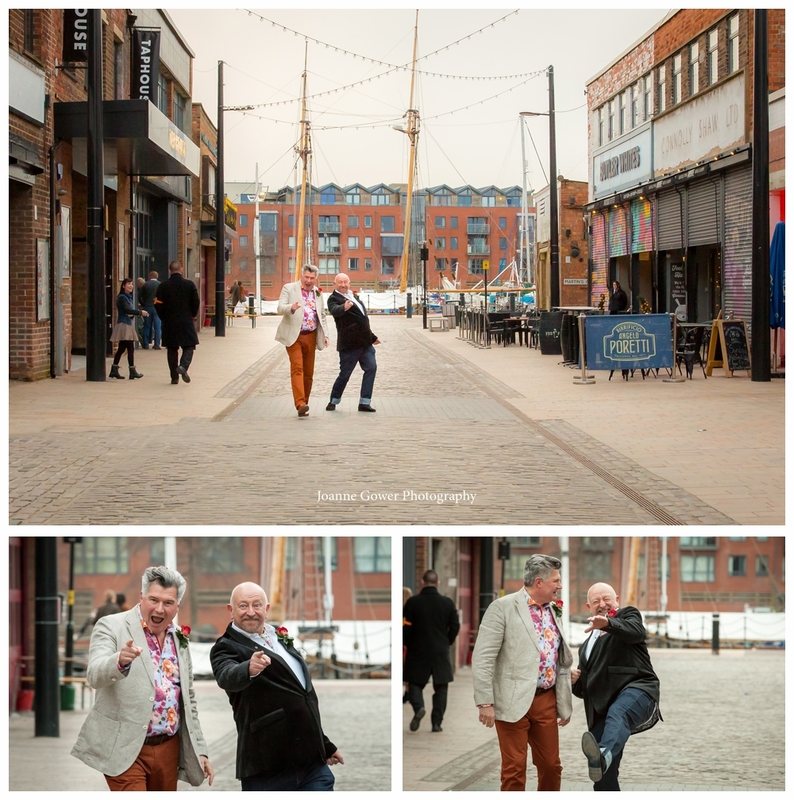 The boys braved the wind and we worked quickly to get their photographs done. 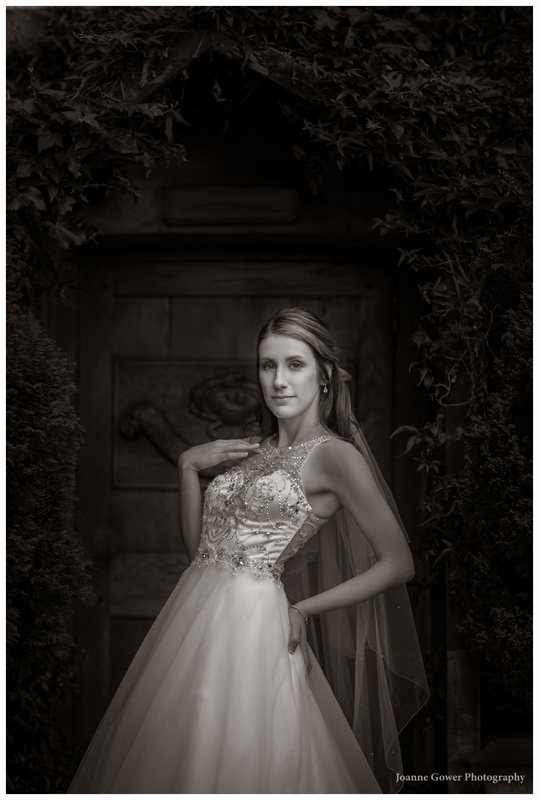 Before long guests began to arrive and we headed back to the bridal suite to capture Becky’s final few minutes as a single lady. 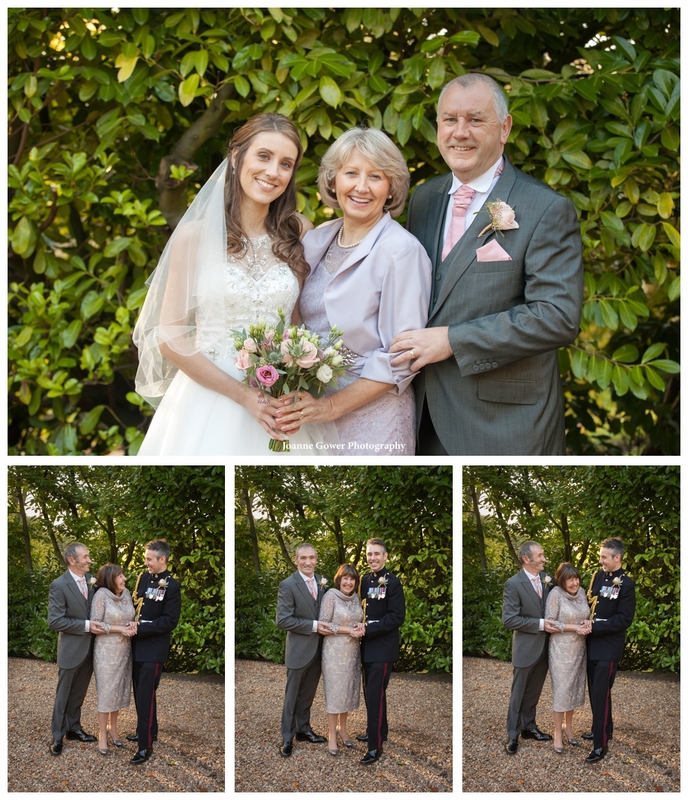 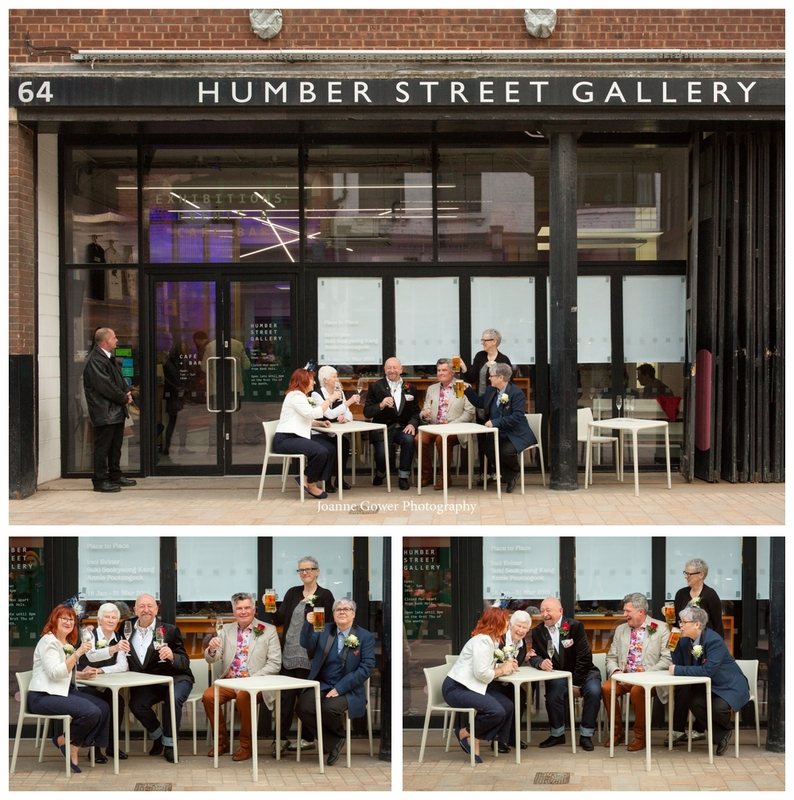 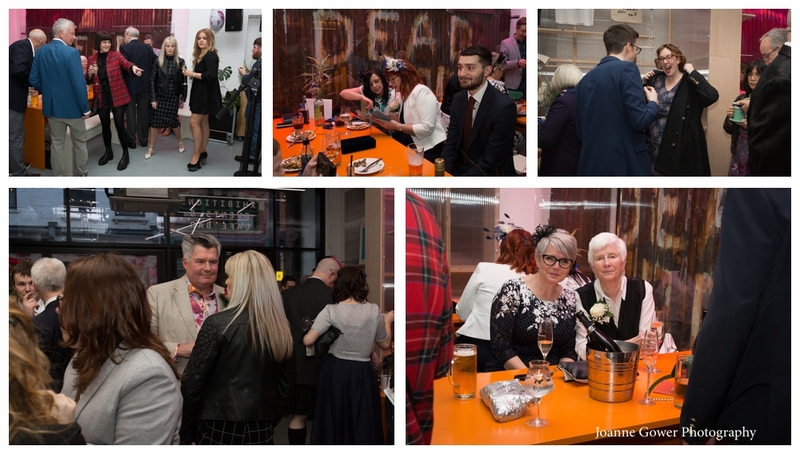 After the service, guests enjoyed a celebratory drink whilst we took the all important family formal photographs. 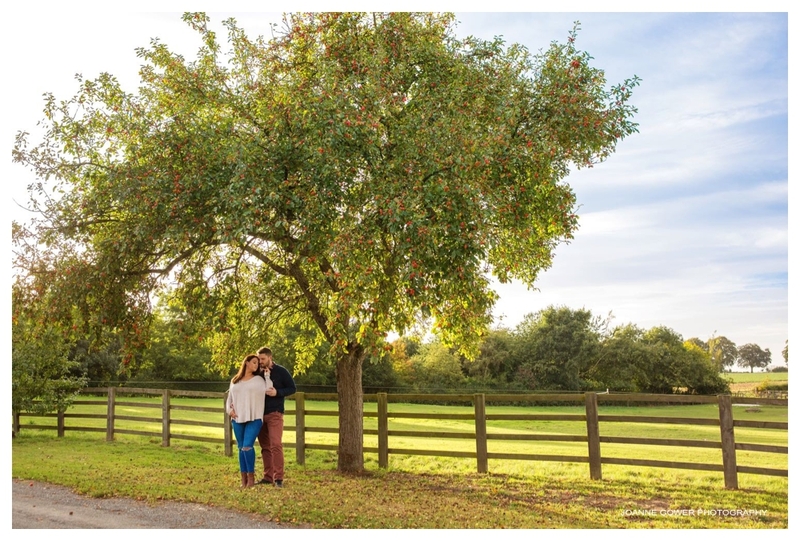 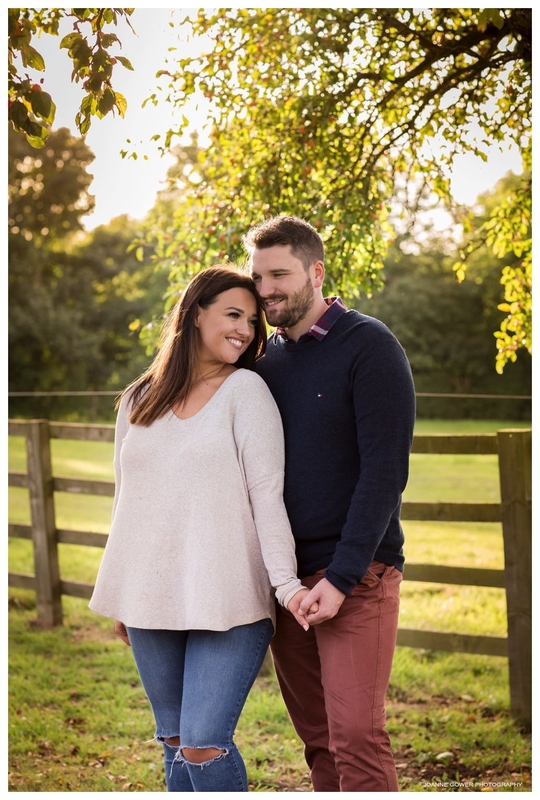 We had such fun with Becky and Sam during the couples portrait session and they were very relaxed and easy for us to work with. 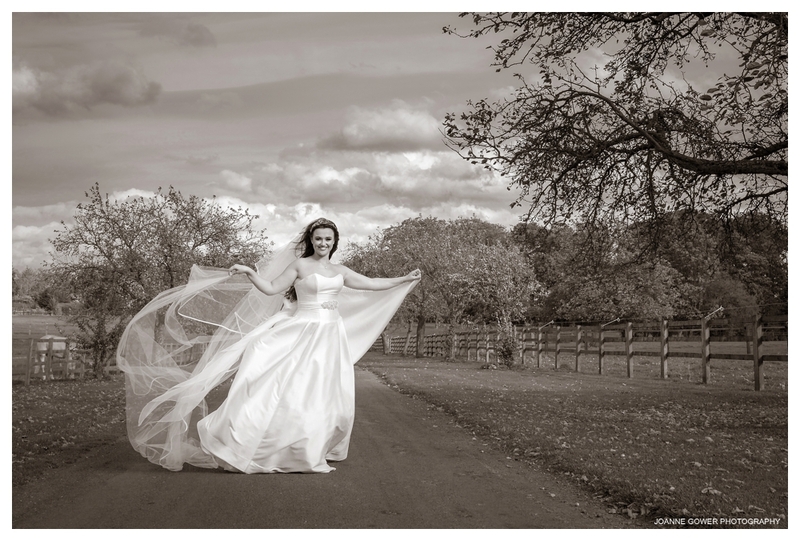 Becky in particular was such a good sport and didn’t let the raging gale bother her and as a consequence we were able to create one or two very special images for her. 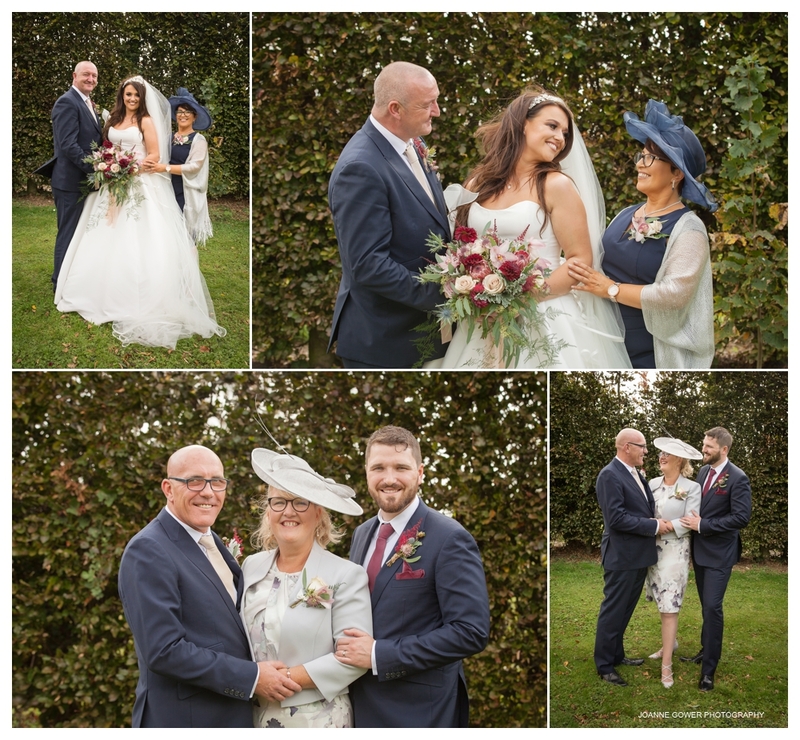 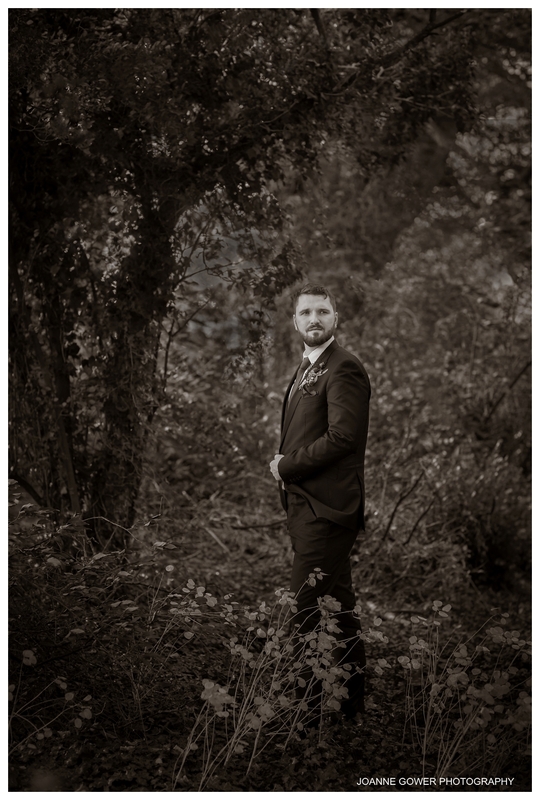 It was a challenging day from a weather point of view, and David and I struggled to keep our feet on the ground at times, but Becky and Sam are such a lovely couple and were so easy to work with, that we managed to get some lovely images for them. 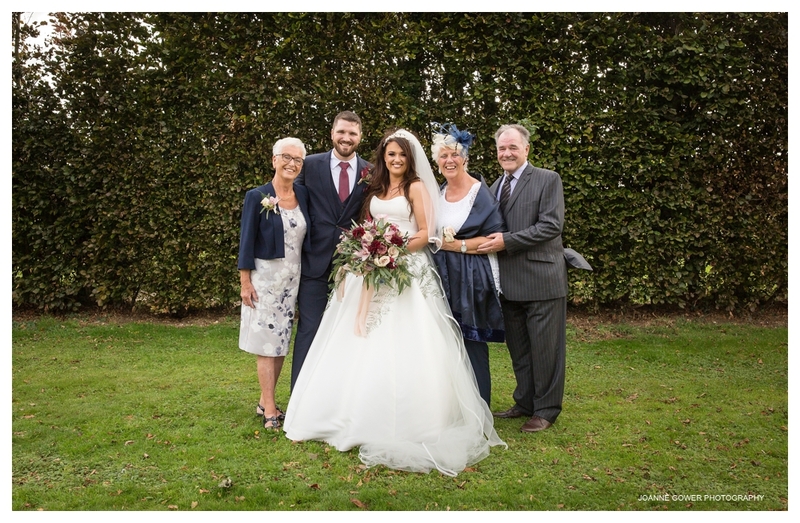 We wish them, and their family every happiness in the future. 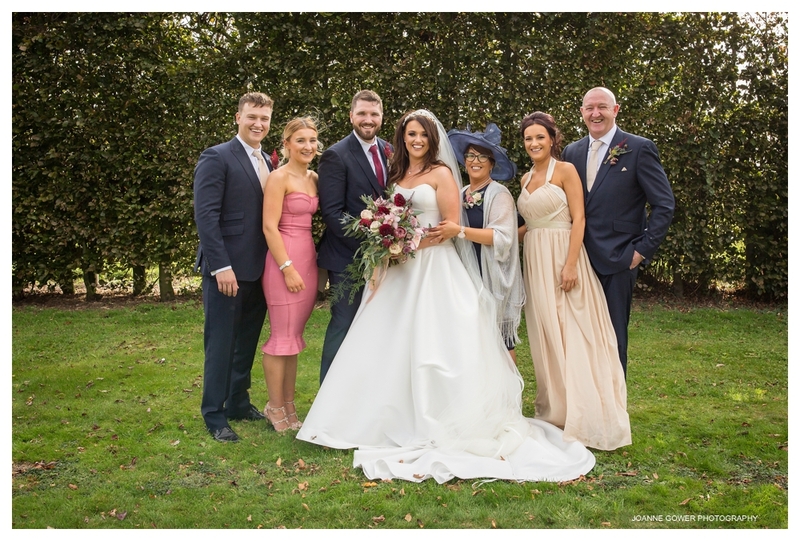 We are now taking bookings for weddings in 2019, 2020 & 2021, so if you are looking for a wedding photographer in the Yorkshire region and want the very best, give us a call! 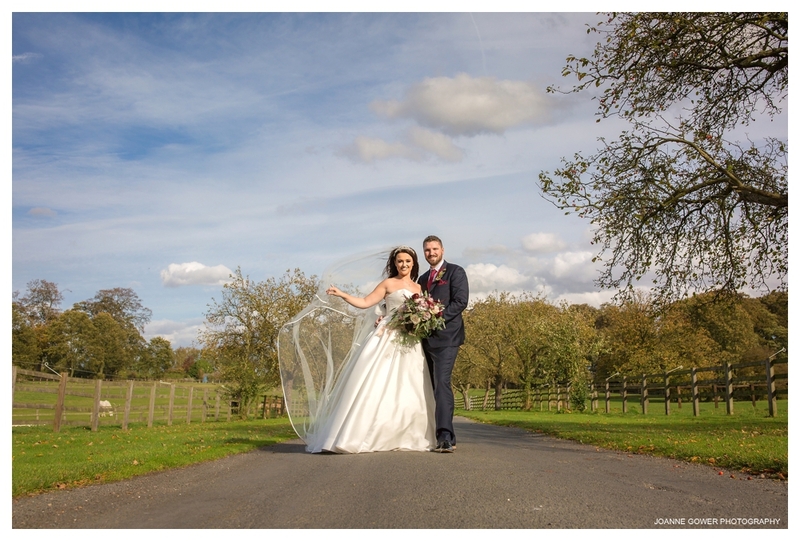 On Saturday we met up with Victoria and Joe who are getting married at Crab Manor, Thirsk. 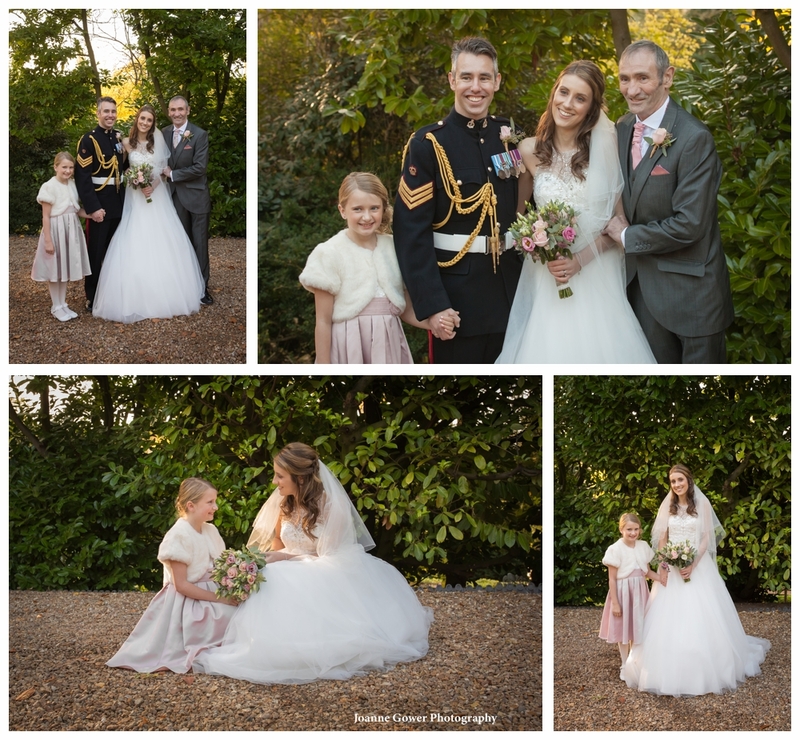 We were very lucky to get a bright sunny morning for the photoshoot, as the gardens at Crab Manor are beautiful for photographs. 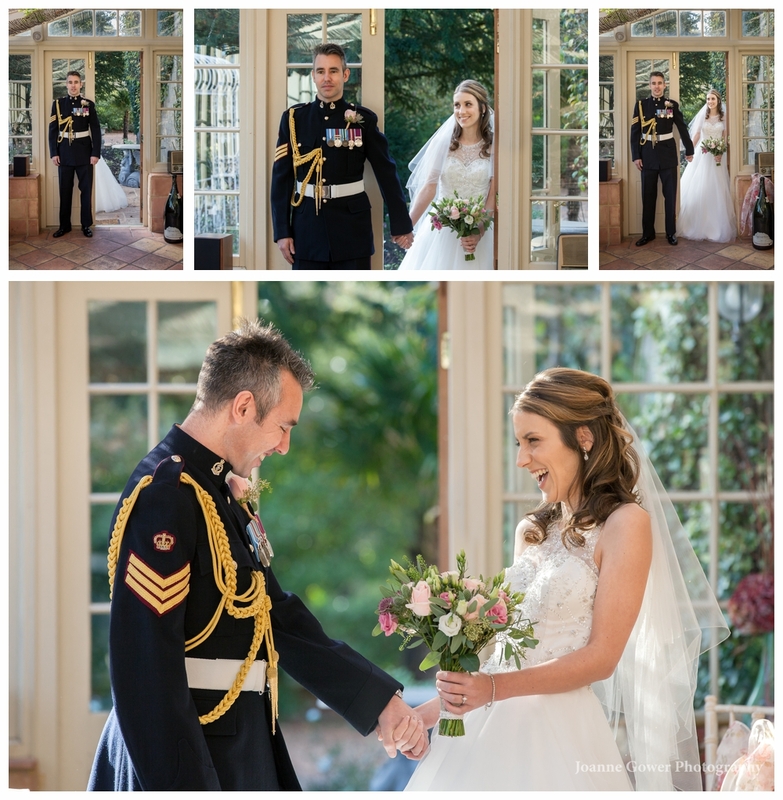 We also had a lovely chat in the main house, with Victoria and Joe, about the arrangements for their wedding day. 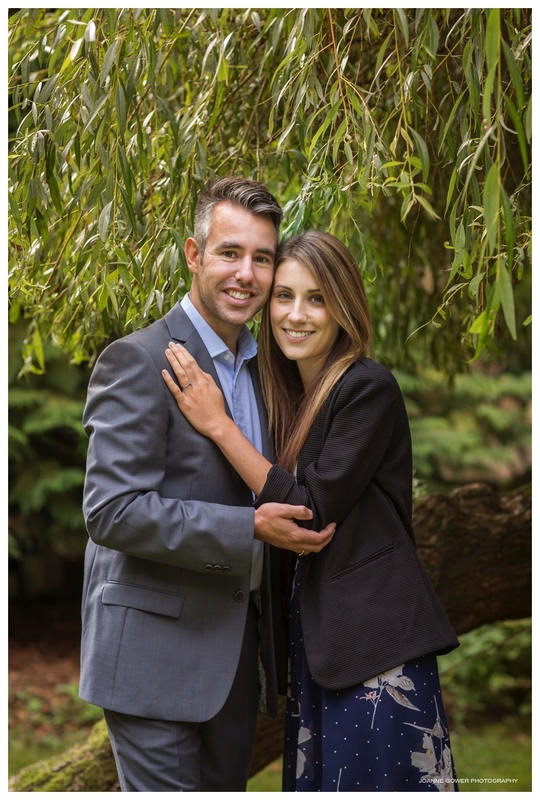 They will be sharing the day with an intimate group of their close family and friends. 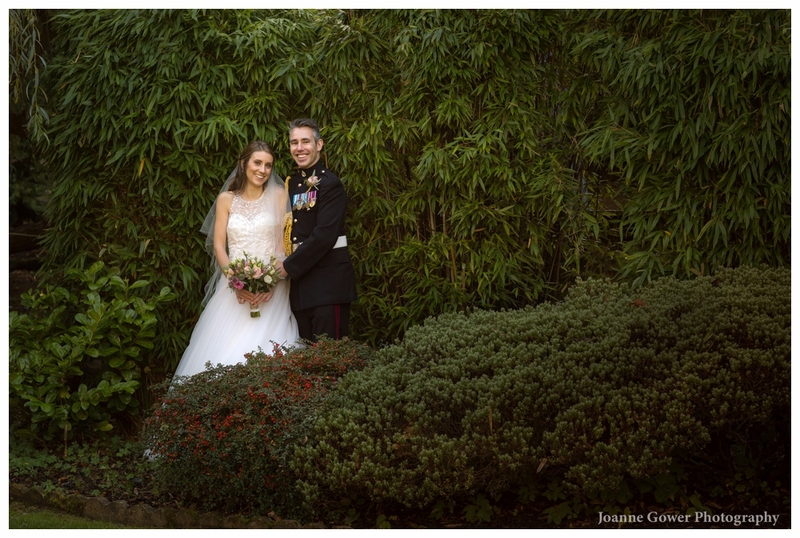 Victoria and Joe were such great fun to work with and we are very much looking forward to photographing their wedding day. 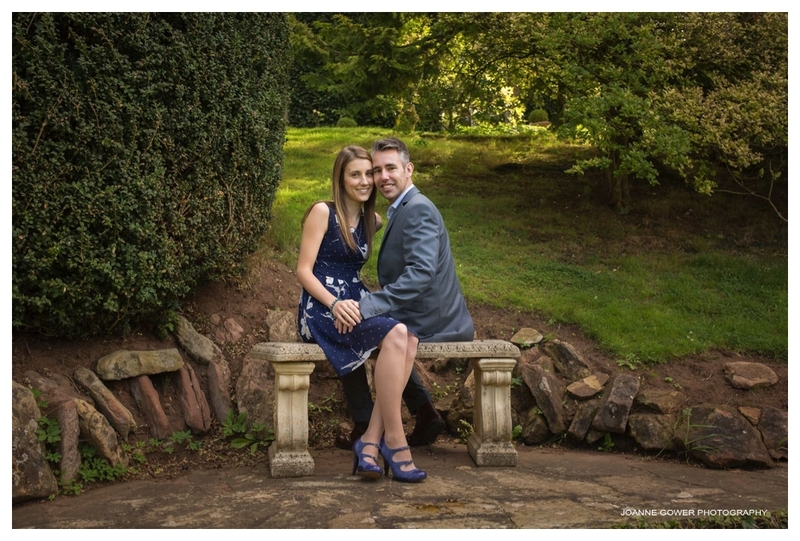 On Tuesday evening we met up with Becky and Sam who are getting married in October at the fabulous Rowley Manor. 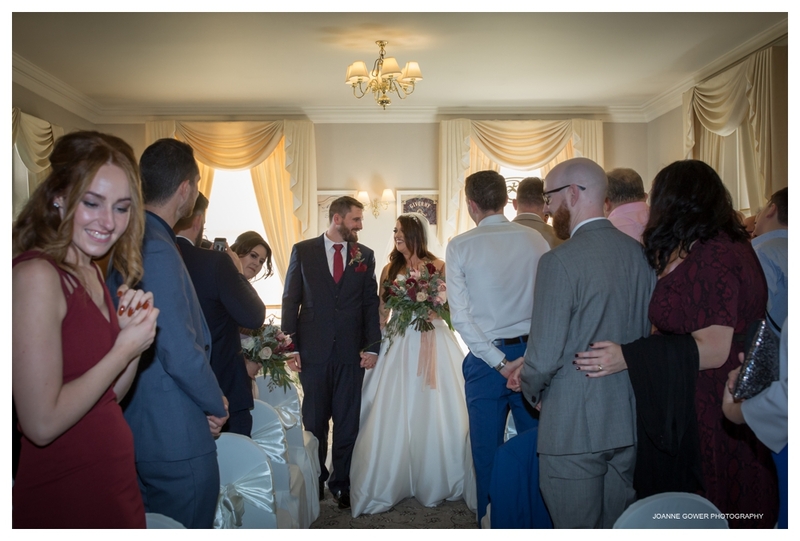 It is always a joy to work at Rowley as Amanda and her amazing team always offer us a very warm welcome. 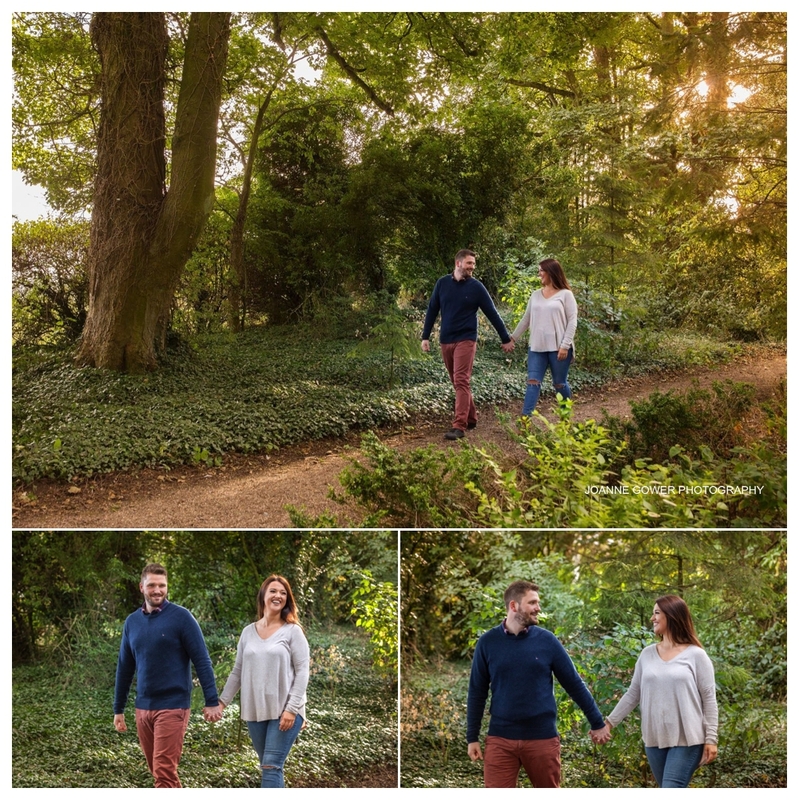 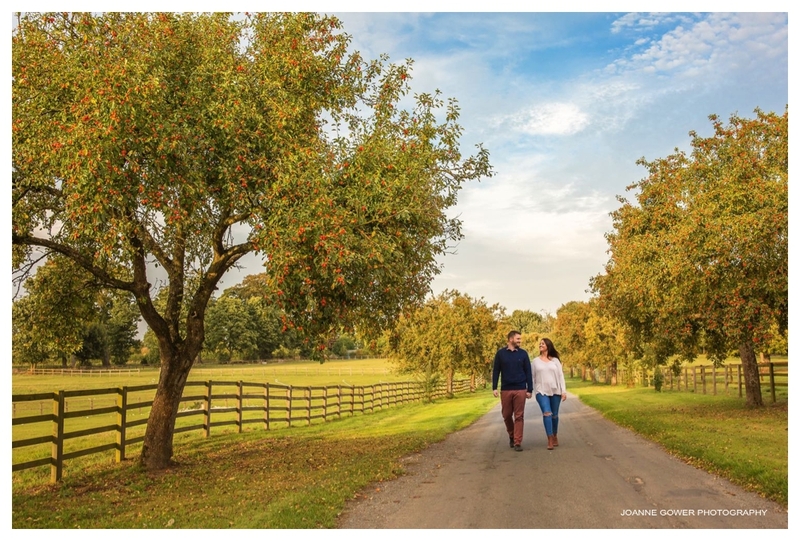 Aside from that, Rowley offers many lovely locations for photography and on Tuesday we were lucky enough to be able to shoot when the sun was about to set which affords some beautiful light for photography. 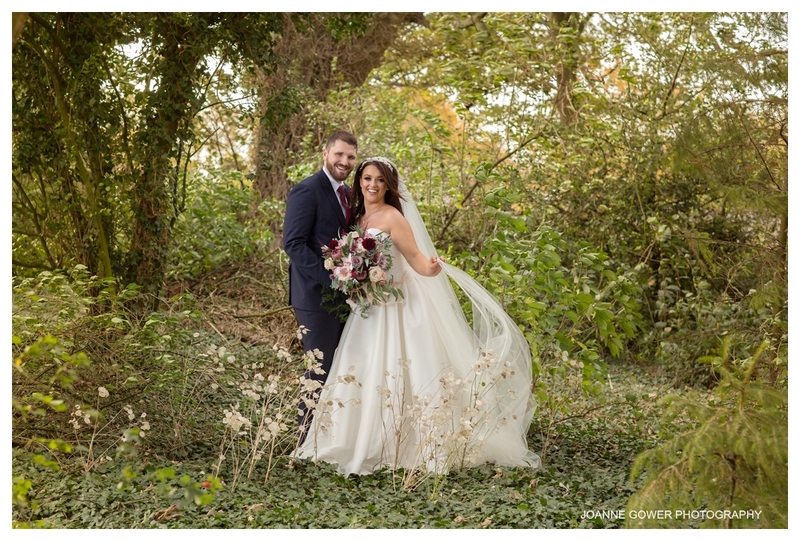 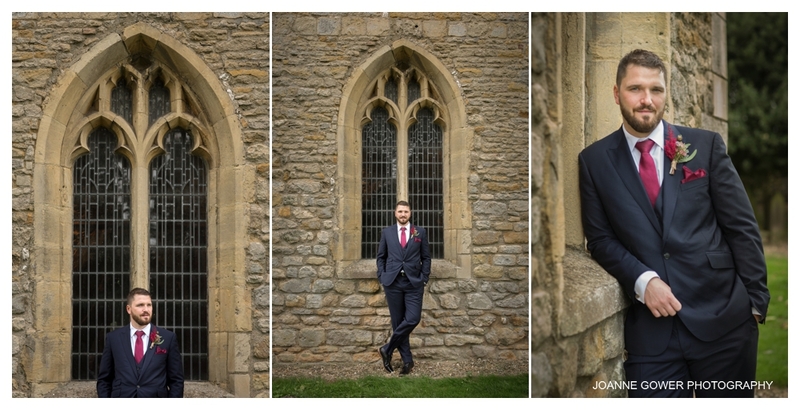 So just when we thought things could not get any better with stunning light and a lovely location, we then were able to work with what can only be described as our dream clients! 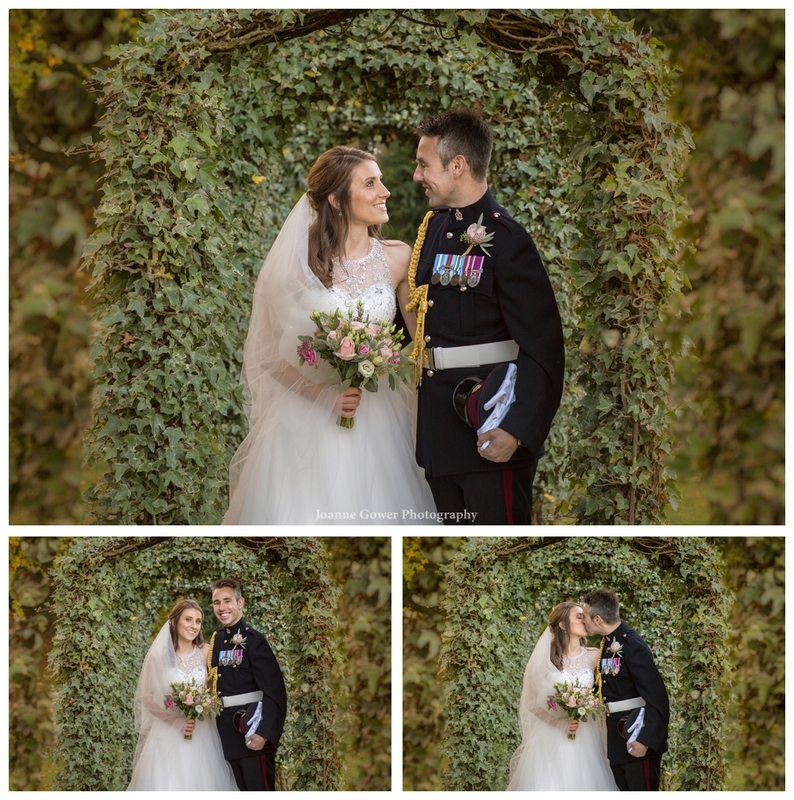 Becky and Sam where such fun to be with, totally at ease with one another but more importantly, they were absolutely at ease in front of the camera! 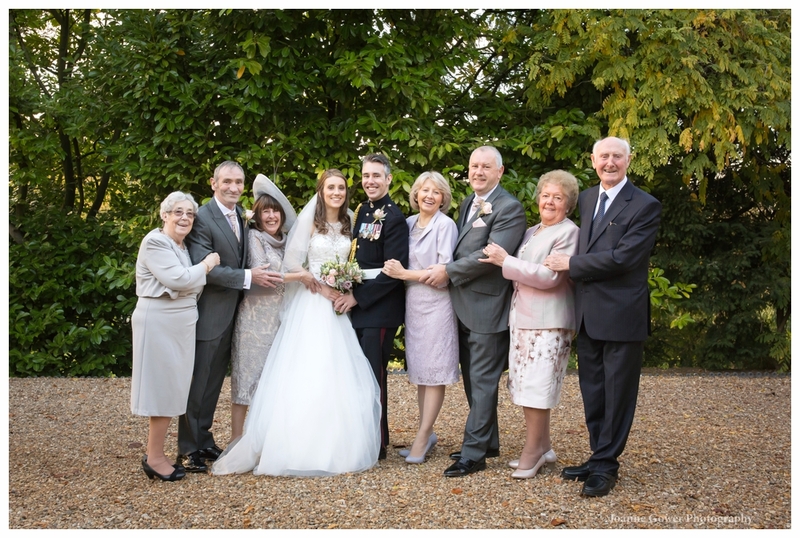 All of these factors made our job very easy and it certainly didn’t feel at all like work! 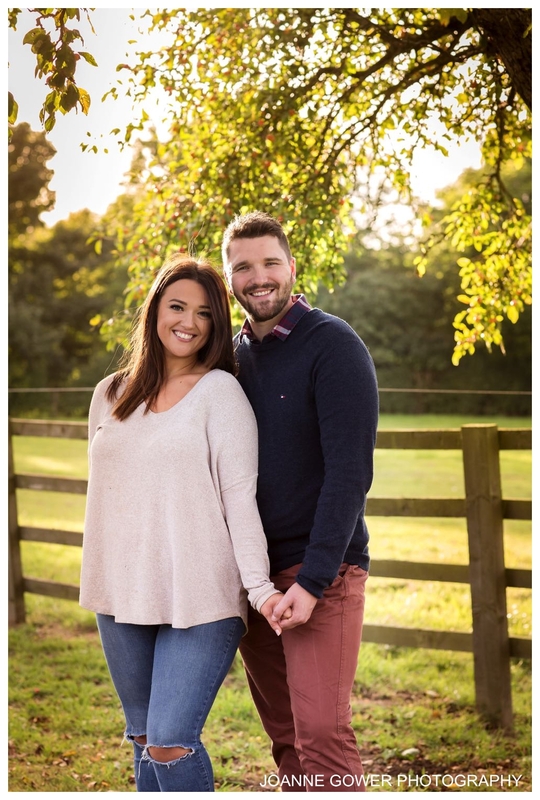 Needless to say, that we are very much looking forward to photographing their wedding day and hoping for some lovely autumn sunshine for their photographs.